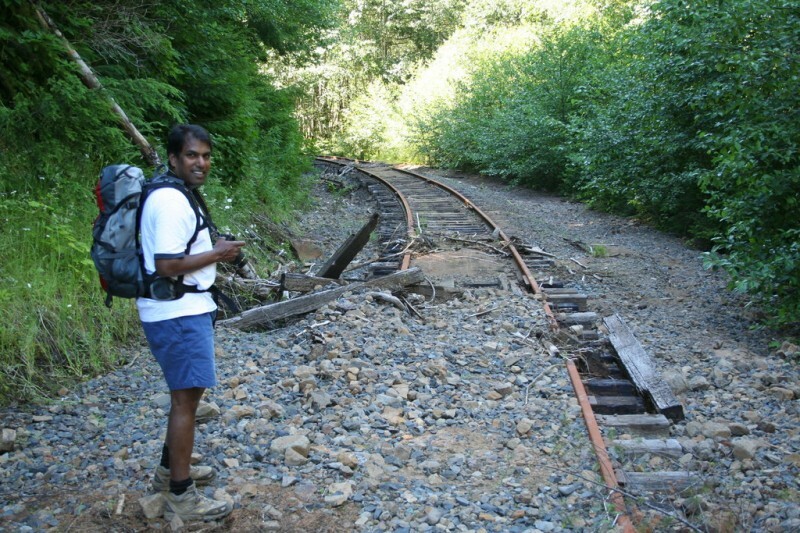 My friend Sam is a railfan and has done quite a bit of exploring of and hiking on railroad tracks throughout his life. 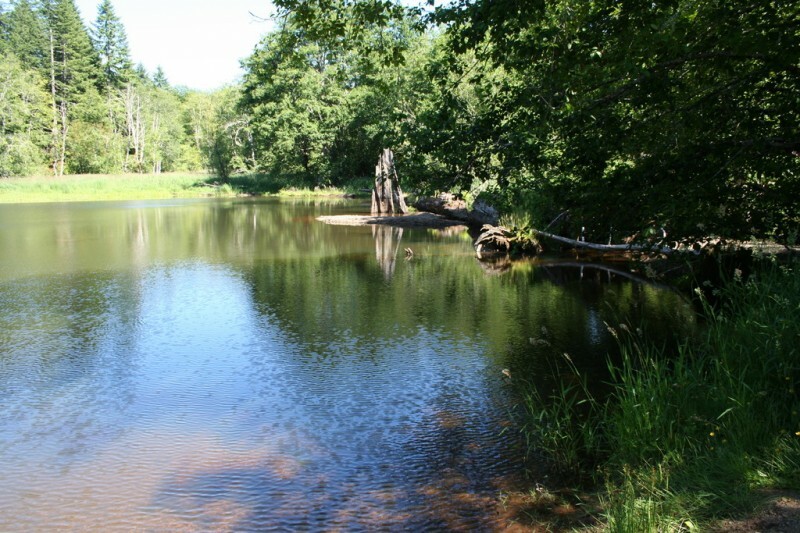 He had told me about a couple of these hikes that he wanted to take me on. I was sort of skeptical about the whole thing, but I decided to check one out, and it turned out to be really interesting. 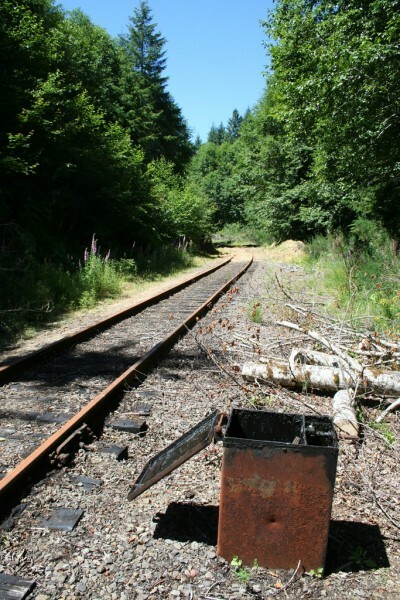 He sort of explained the concept of this activity as a way to go to places that were pretty inaccessible via other means, since railroads cut through sections of terrain where there are not necessarily any other access points. I was picturing seeing some cool scenery and just experiencing some solitude since there probably weren’t too many other people doing the same thing. The things that ended up being the hightlights of the trip were a bit different. 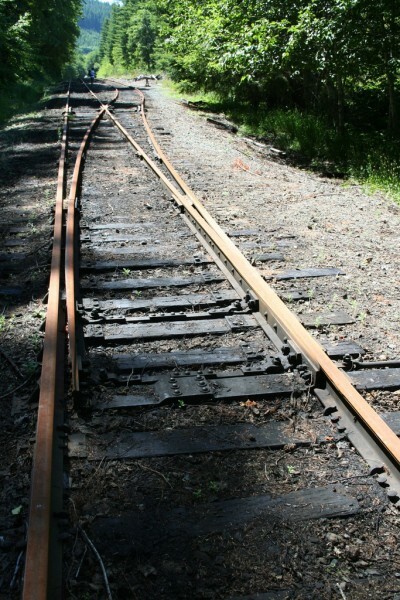 First of all, I learned some things about railroads that I never knew before. 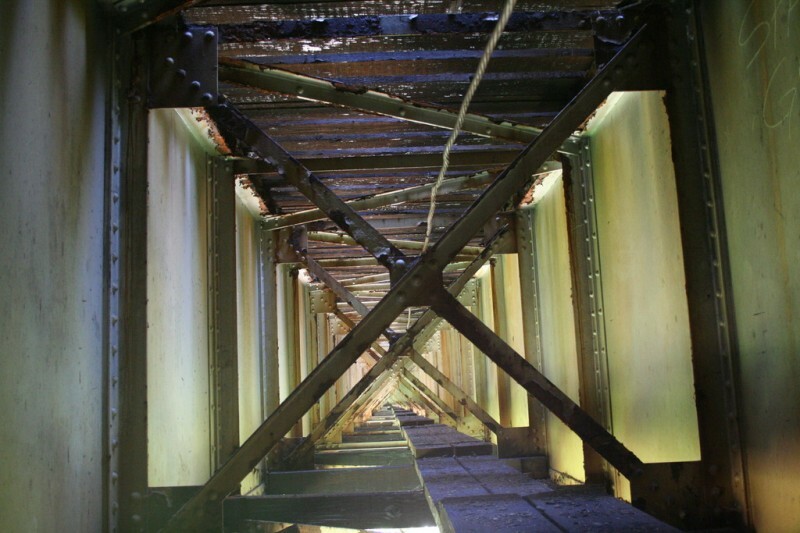 I got to see some awesome railway trestles, a tunnel, various utility machines, track components and switching devices that I’d never seen up close or at all before, and Sam was able to share some of his knowledge of all these things with me. 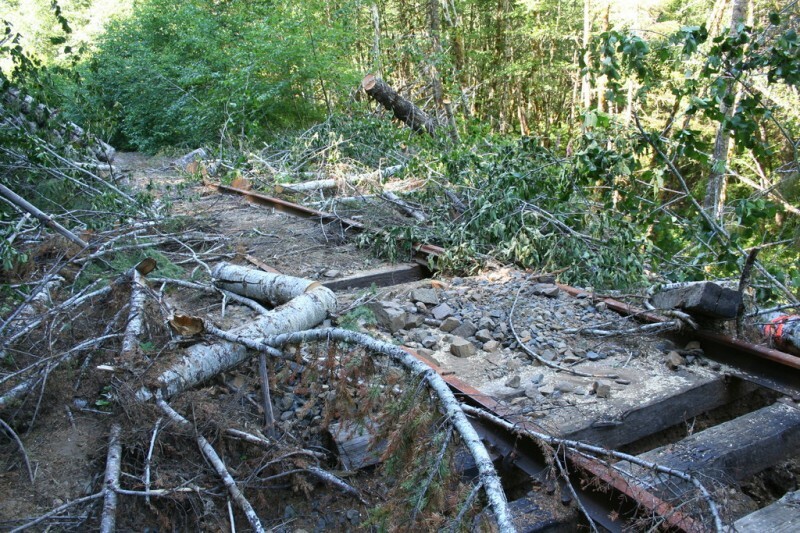 Second, and equally amazing, we got to see the effects of a major storm that happened the previous winter that had, to our surprise, rendered the railway unusable for the time being. 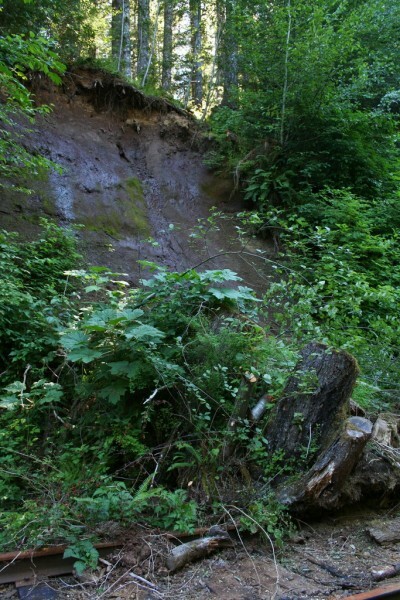 The damage was pretty severe, and apparently what we saw was not nearly the worst of it. I felt priviledged to be able to see it and photograph it up close. 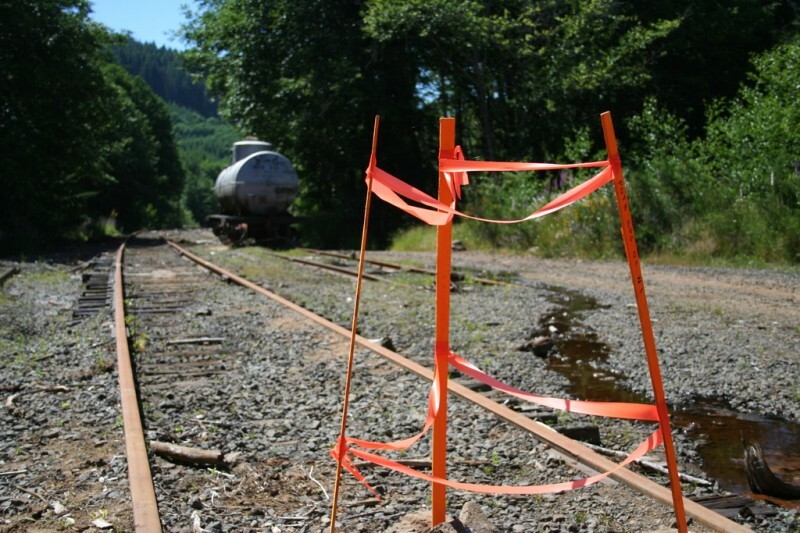 And as a disclaimer, I just noticed a statement on the Tillamook Railroad website that the tracks are closed to unauthorized use and that they will prosecute violators for criminal trespass. 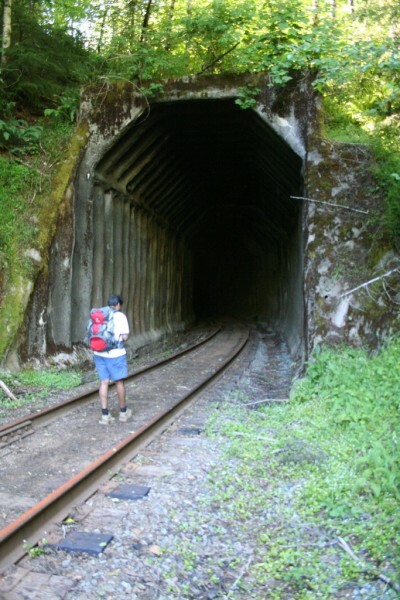 Also, as is obvious, walking on active railroad tracks, especially on trestles and in tunnels could be extremely dangerous, so I am not recommending it. Don’t try this at home. 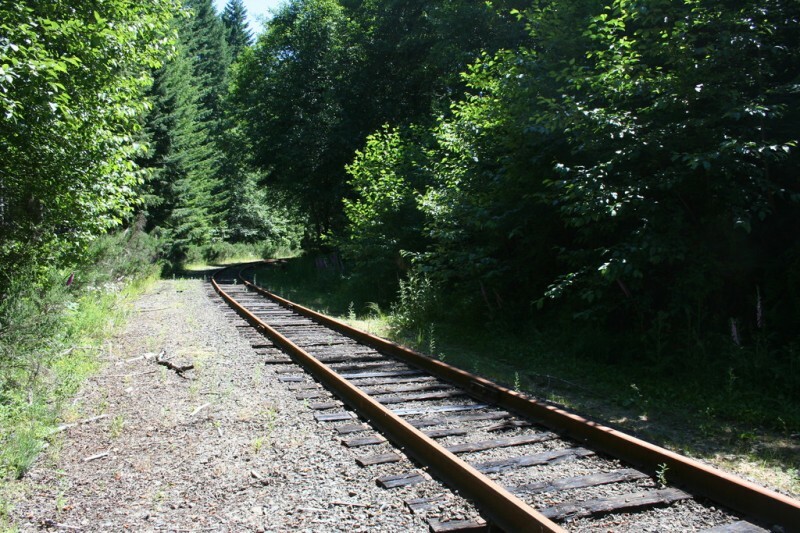 From where we parked, at a random place where the railroad tracks crossed the forest service road we were on, we set off down the tracks in the wrong direction. 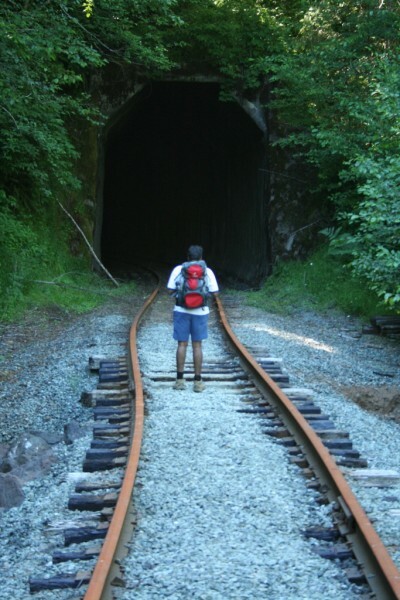 Of course, there is not necessarily a right or wrong direction, but we went the opposite way of the way Sam wanted to go, where we could cross some cool trestles and see a tunnel or two. 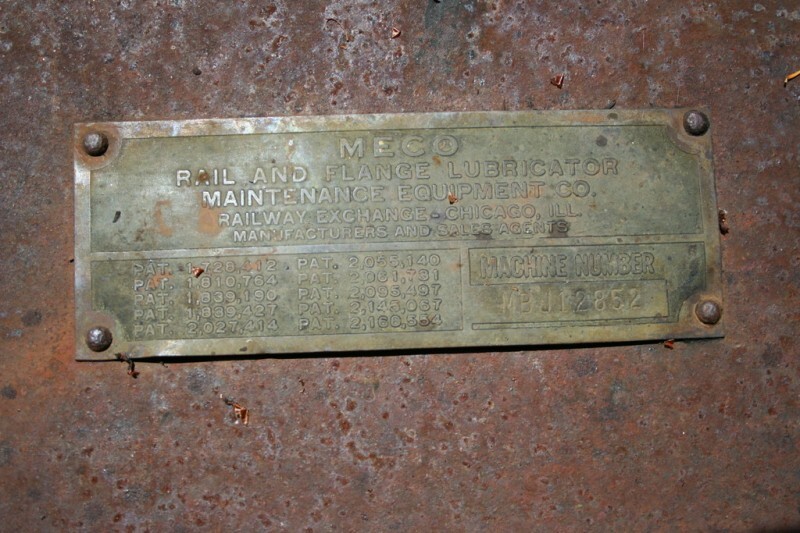 But as a result of our mistake, I got to see and learn about the device that this tag was on: a Rail and Flange Lubricator. 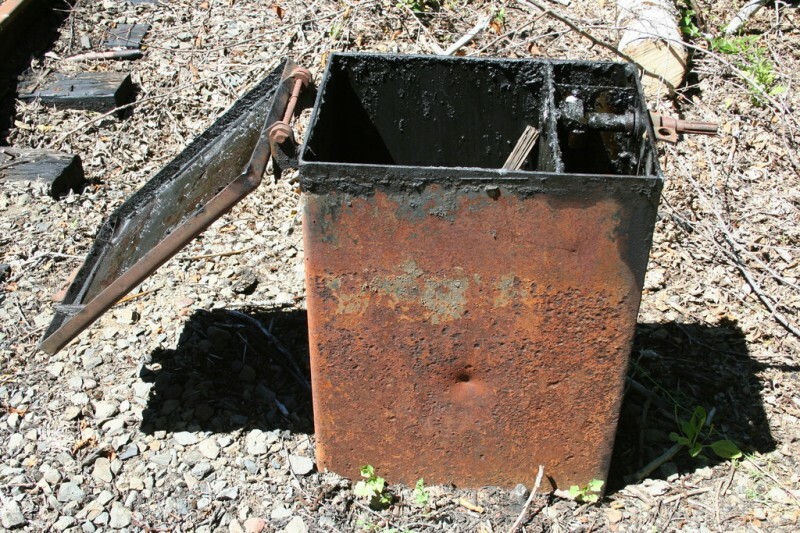 This particular device was not in use, and as a result the lid was unlocked. 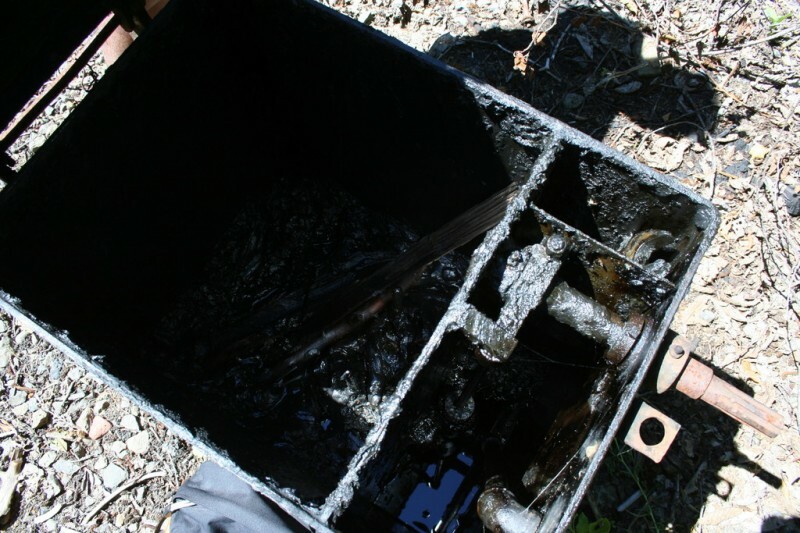 So, we were able to lift the lid and look inside the grease tank of the device. I took several photos 'cause I thought it looked pretty cool. 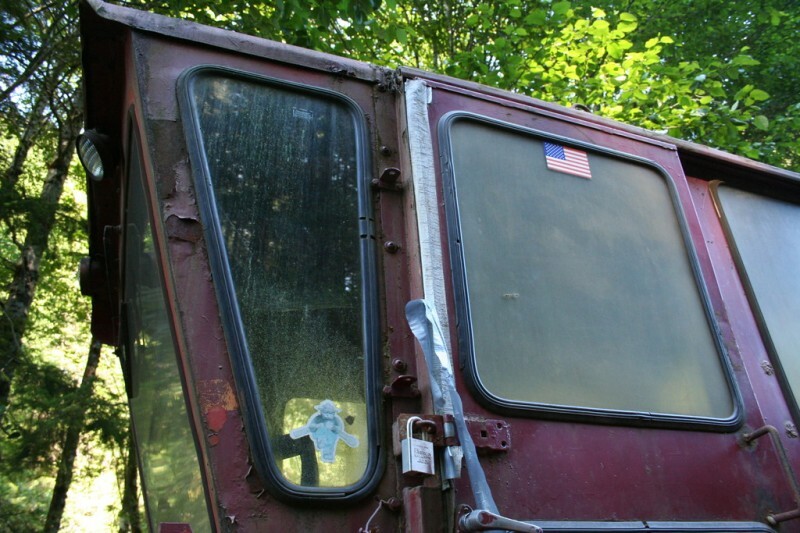 This was what the tank looked like from the outside. It had probably been there a long time. Apparently someone thought this would be a good place to store some sticks as well as grease. Apparently they store the wrench inside the tank that they need to work on it. It was pretty greasy. 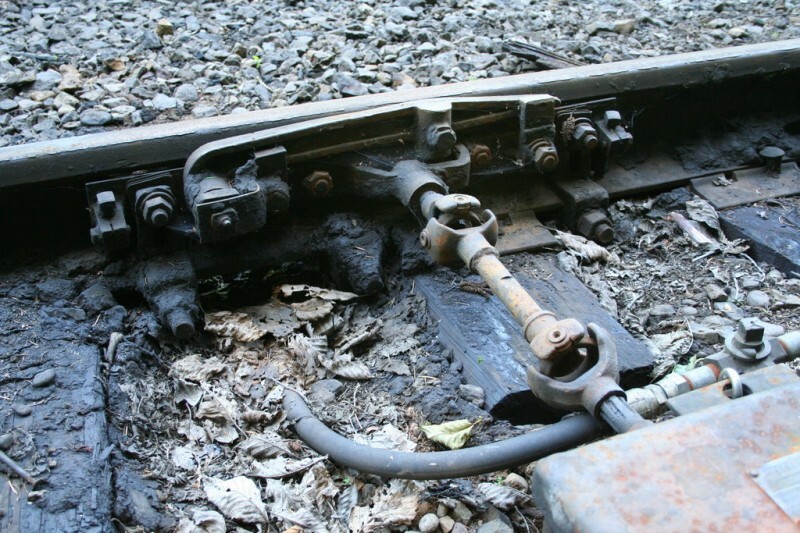 Sam explained to me that this device is used to lubricate the wheels on the train as they pass over the track. 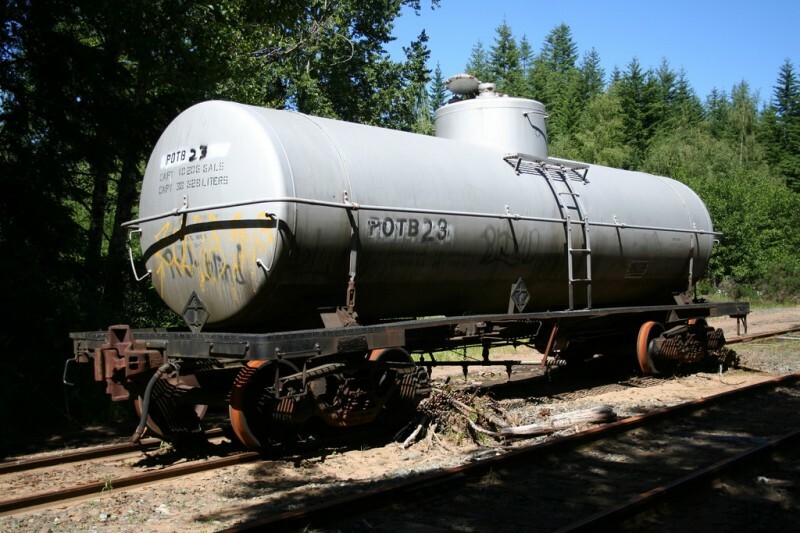 There is a pipe that connects the tank to a device on the track which is activated by the weight of the train. I guess Sam has tried hard in the past to get one of these to activate with his own weight, but was unsuccessful. I guess it requires quite a bit of force. 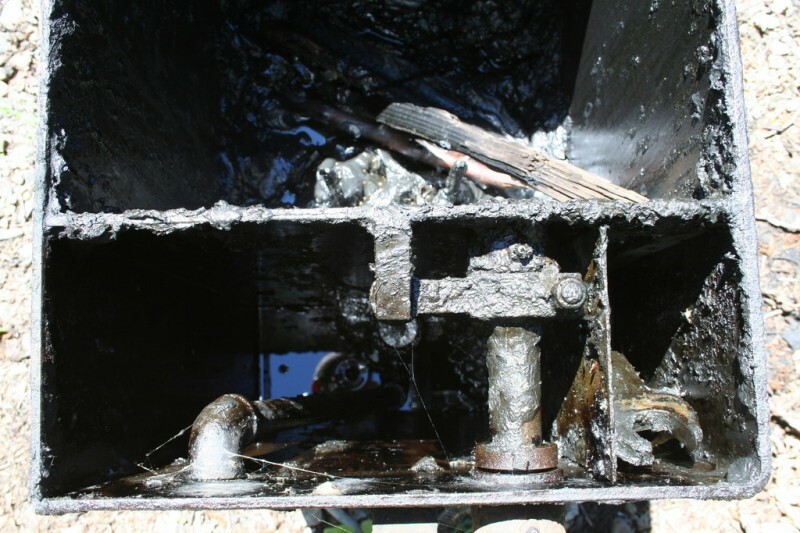 I think part of the mechanism here was missing, as this one was not active, but you can see where the pipe connects to a device on the track, and you can see where the grease has been sprayed out all over the place. 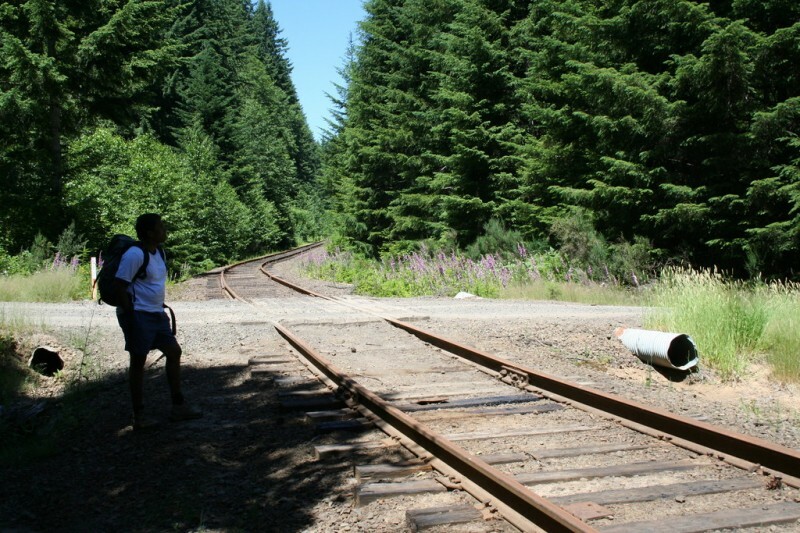 This random spot where the tracks intersected another dirt road was were we stopped to eat our lunch. We mainly just wanted to find some shade as the sun was pretty intense that day. At this point we had realized we went the wrong direction and had turned around, passed our starting point and headed a decent way in the direction we wanted to go. 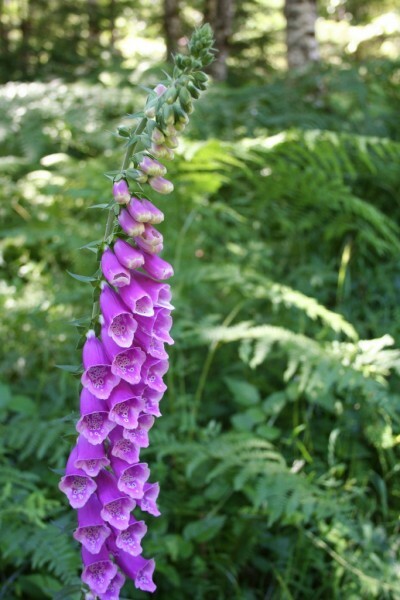 There were quite a few of these purple foxglove flowers along the tracks, and especially around where we stopped for lunch. 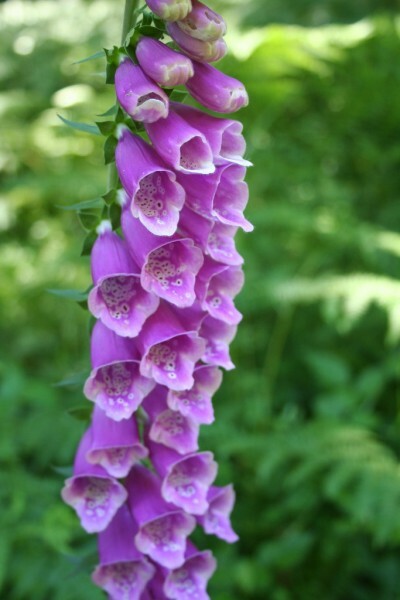 I've always liked them--there are a lot of them at Taylor Park where I go camping with my family. 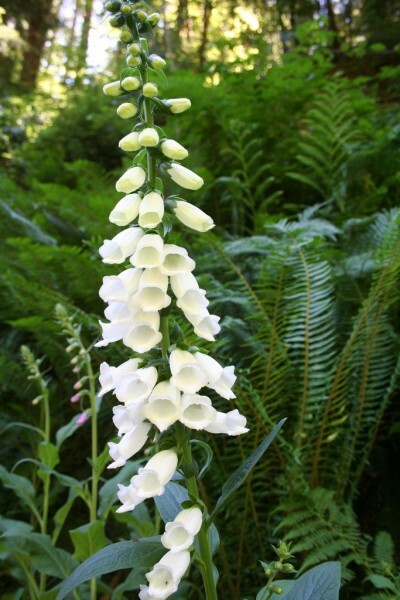 The intricate details inside the flowers are pretty cool. Sam, waiting patiently while I take pictures. 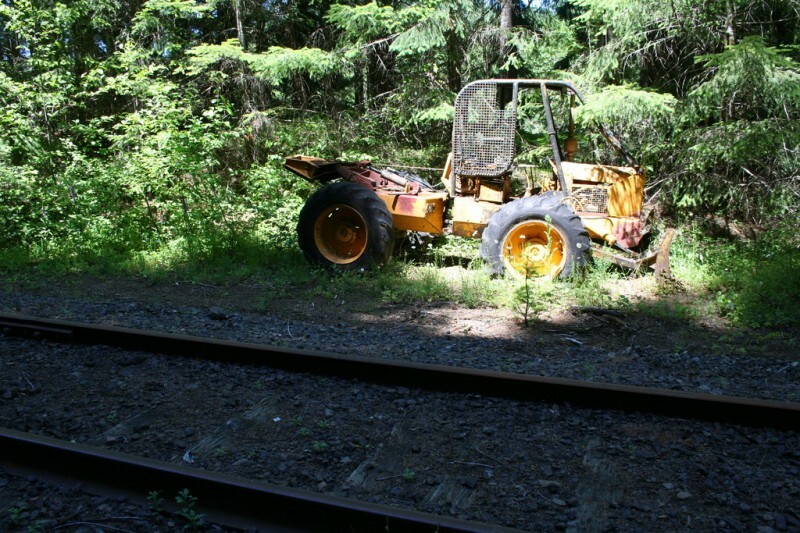 I was surprised to see this little loader apparently abandoned in the bushes near the tracks. 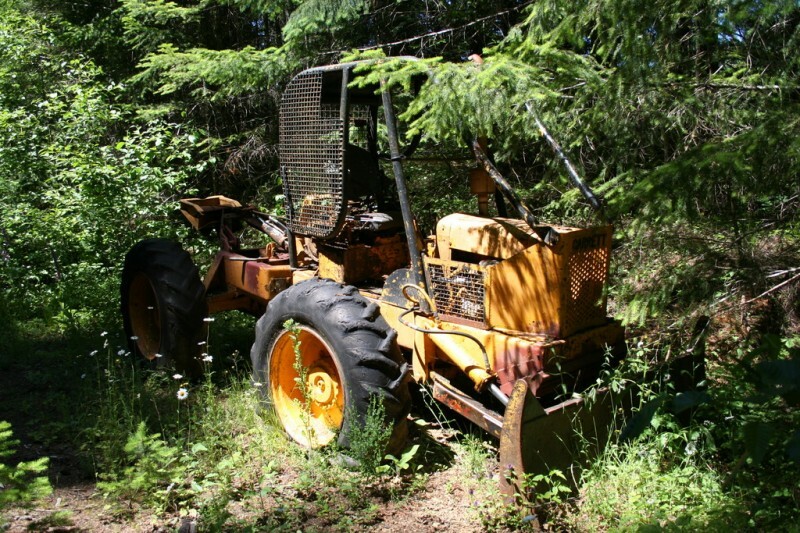 We went over and looked at it, and it appeared as if it had been sitting out there for quite some time, nowhere near a road. 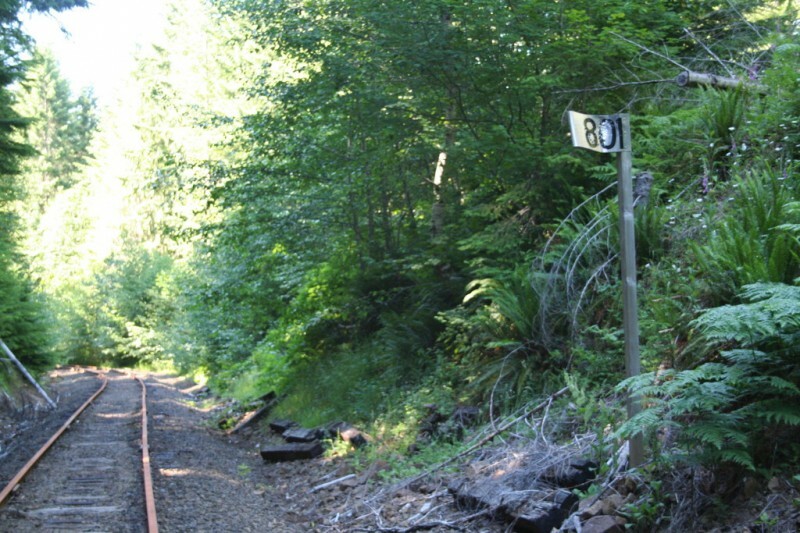 We saw quite a few of these signs and other evidence of buried cables along side the tracks. 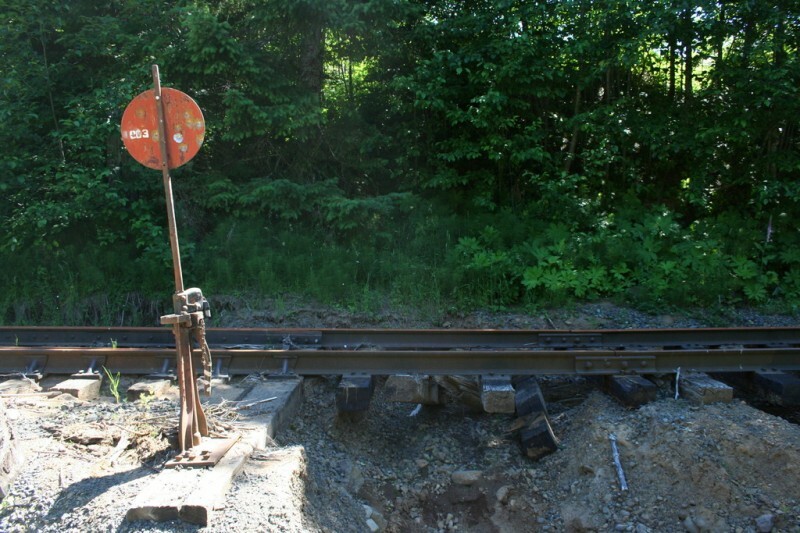 I guess Sam looked it up after seeing these previously and found out that these are pretty major cables that connect this area with Alaska or something like that. Don't quote me 'cause I don't remember, but it was another interesting side note of the experience. 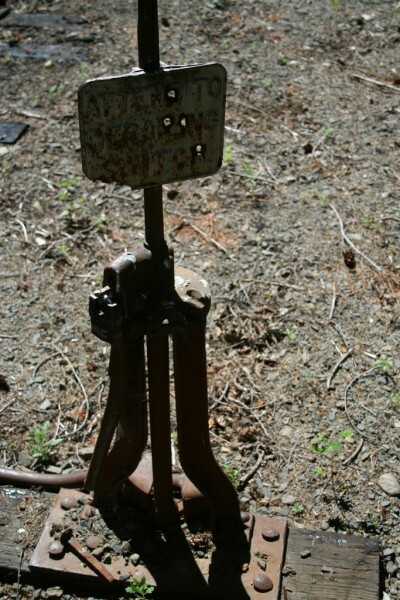 I was pleased to discover another of these rail lubricators, and this one appeared to actually be functional. 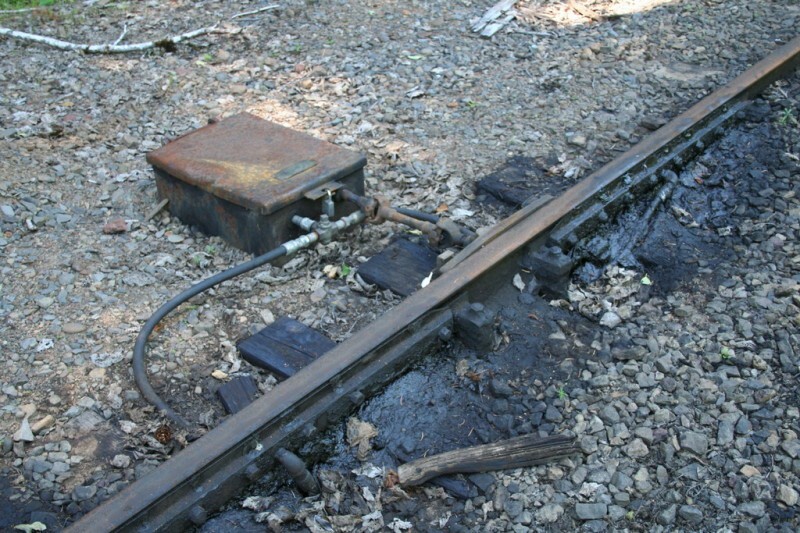 You can see the hose running from the smaller tank to the mechanism on the track, along with a mechanical rod that most likely turns when the train passes over and pushes grease out onto the tracks. 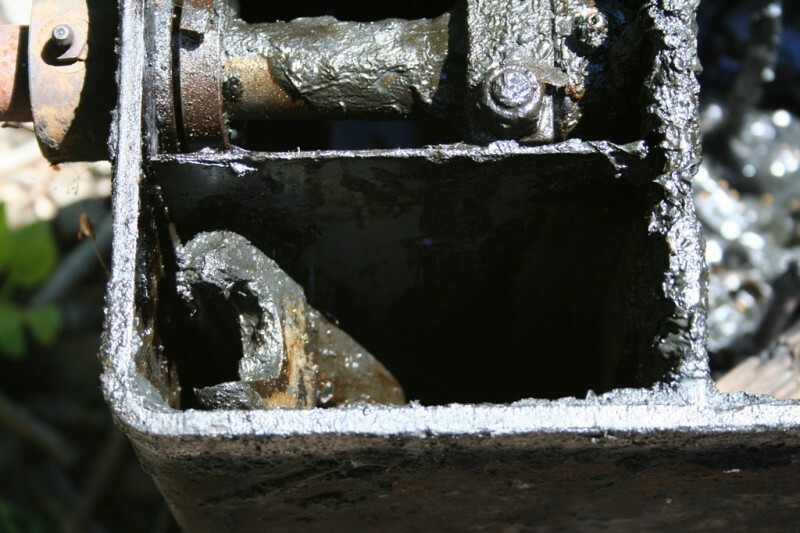 Here is a closer view of the system that causes the lubrication to happen. 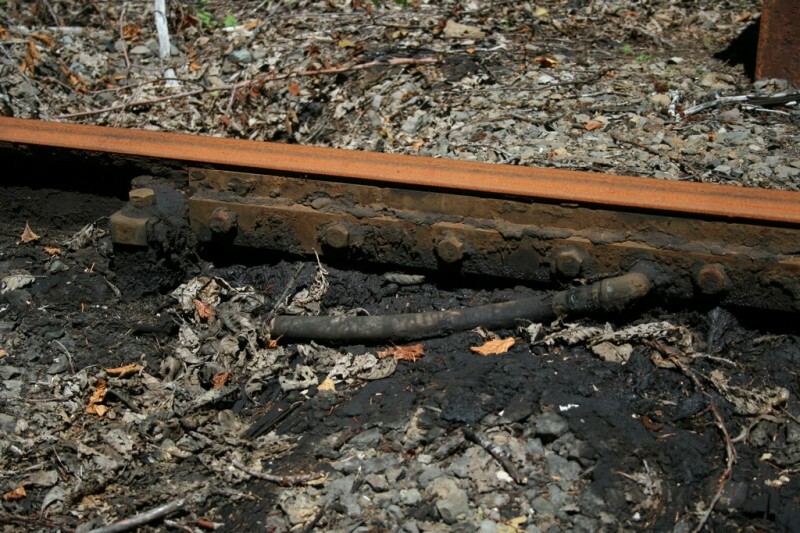 You can see the part of the device right along side the track that probably gets pushed down when the train passes over it, and that is connected to the arm that goes to the tank, which in turn moves grease through the hose onto the tracks. 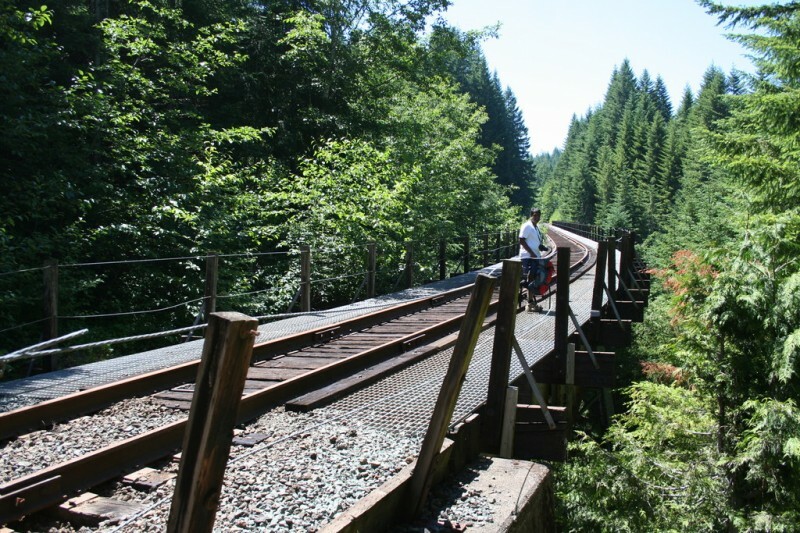 A view of the first trestle we encountered (I'm pretty sure we went over two, but I can't remember where the photos of the first end and the photos of the second begin). 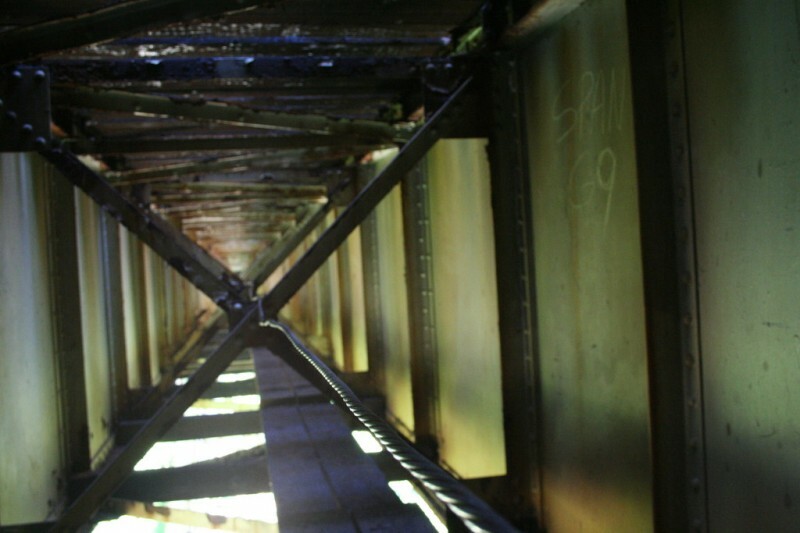 This is sort of looking up at it from a spot at the near end where you could walk down and look underneath. The same shot but vertical. 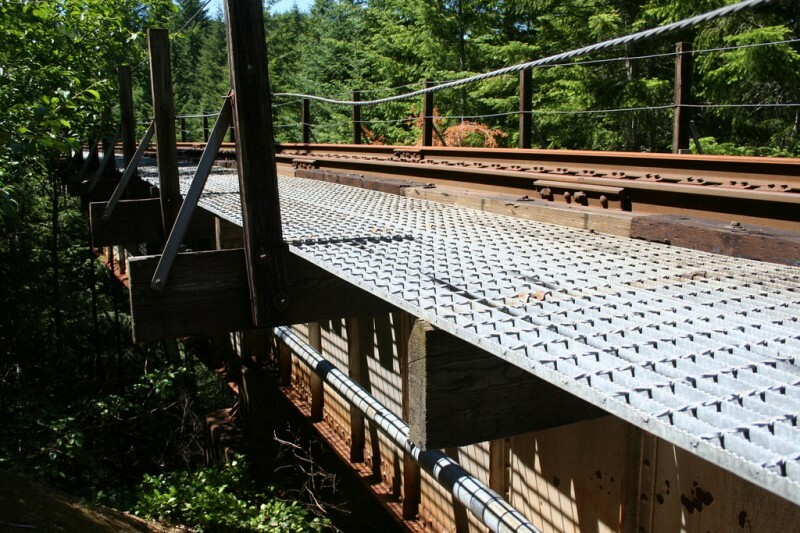 If you look on the side of the trestle structure you can see a large tube. 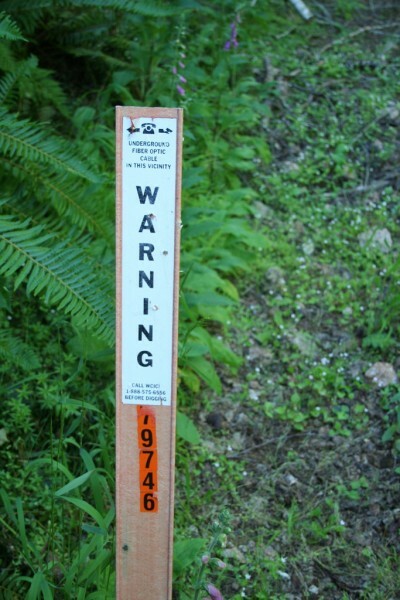 We could see that the buried fiber optic ables fed through this tube in order to cross the gorge. 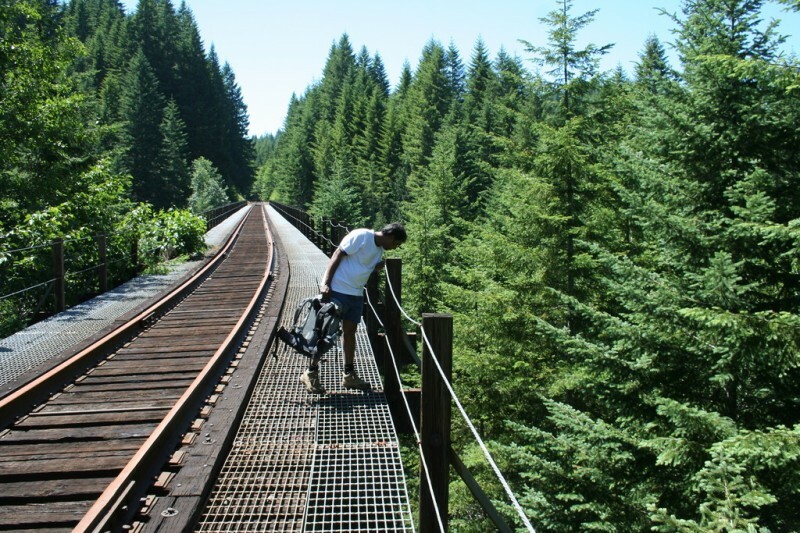 Sam on the first trestle. I'm pretty sure this is the first one. Hopefully Sam can correct me if I'm wrong. 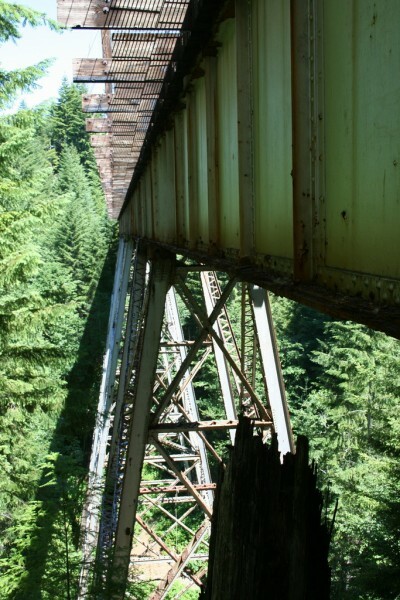 This trestle was so tall that I was trying to find ways to show that perspective. 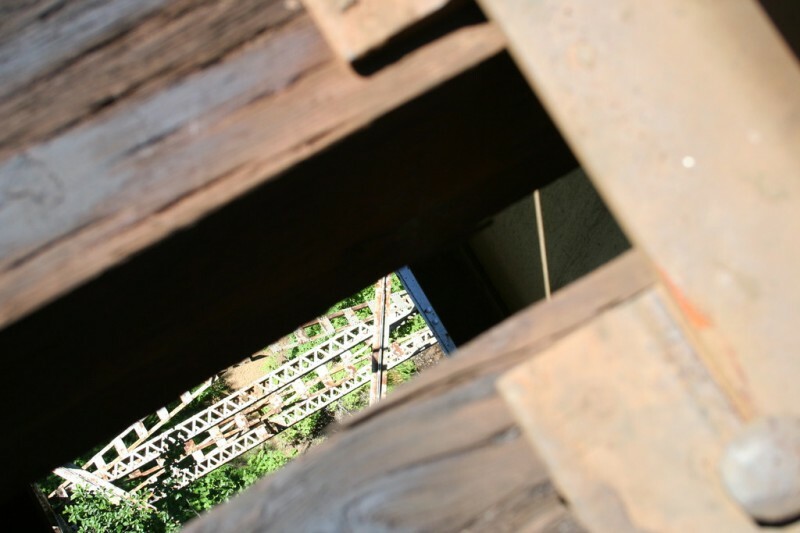 This was a lame attempt, looking down between the boards at one of the supports below. 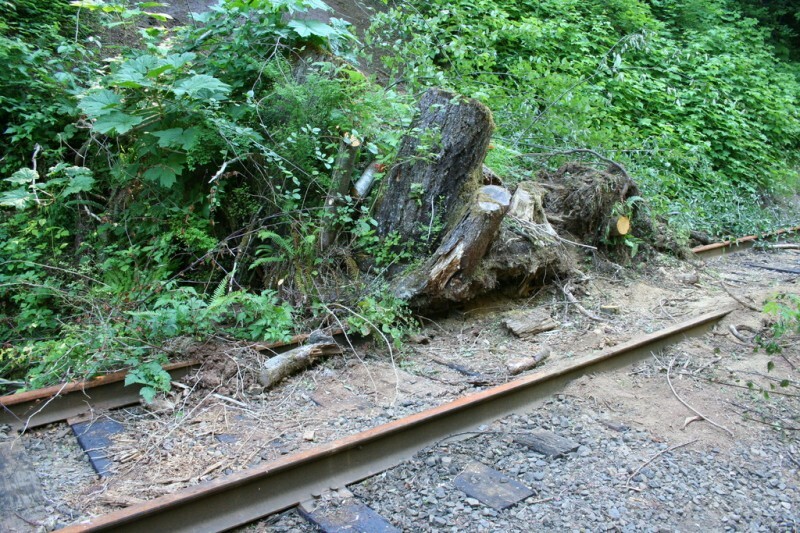 There was a little platform off to the side of the trestle where you could step out and avoid getting hit by a train, I suppose. I'm not sure what the real purpose of it was, but that's what I was thinking about. 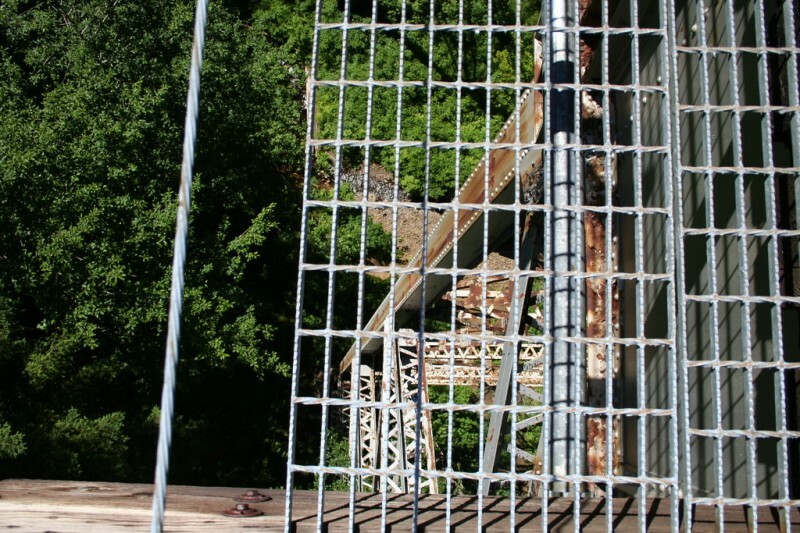 Anyway, this is looking down through that grating at the supports below. 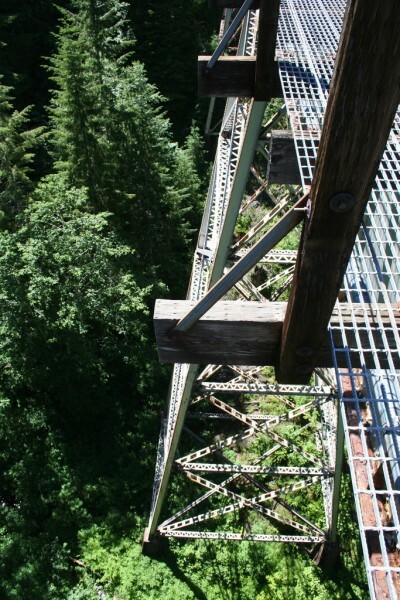 You can sort of see the creek that's running right by the supports too if you look closely. 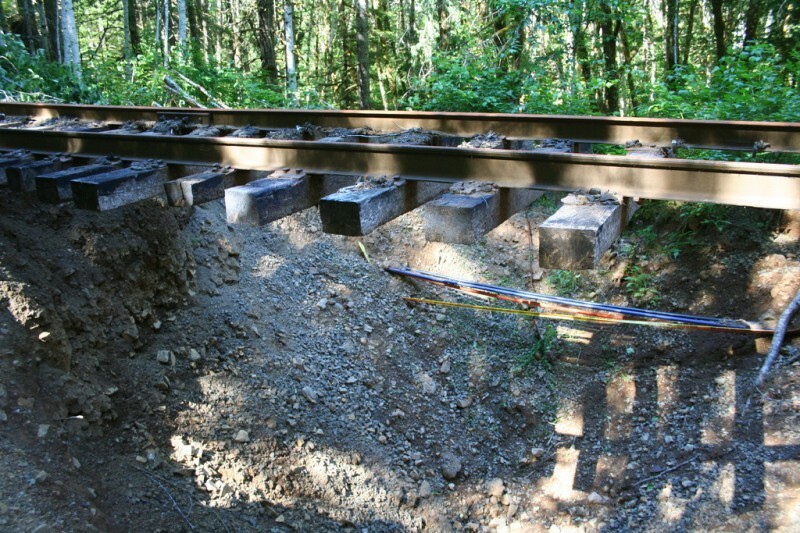 Another failed attempt at showing the height of the trestle. It really doesn't show the perspective well. 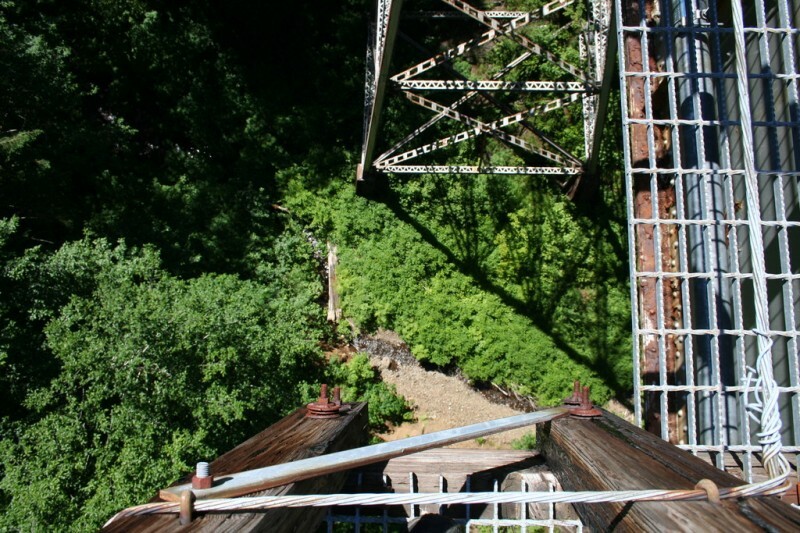 Those concrete supports that look tiny down there we thought were probably twenty feet tall. At the bottom of the photo you can see one of the sides of the little platform I was standing on, and below you can see the creek a little better. 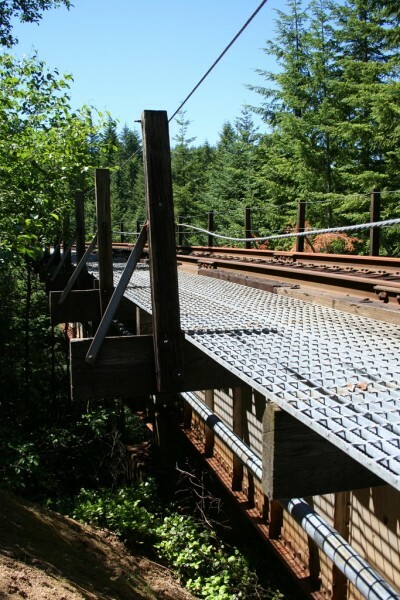 When we got to the other side of the trestle we noticed that we could walk down beside it. The slope was a little steep, but we carefully made our way down there. 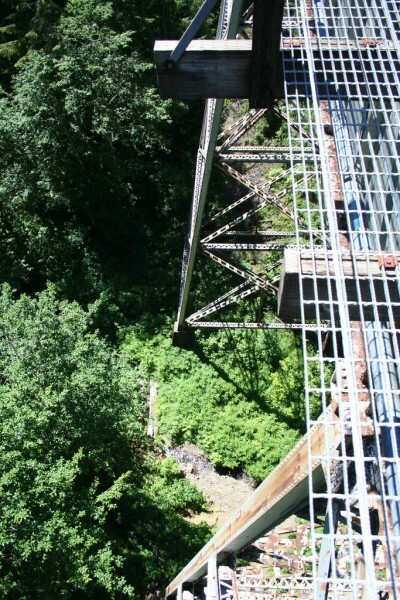 This was the view looking across at the side and bottom of the trestle. 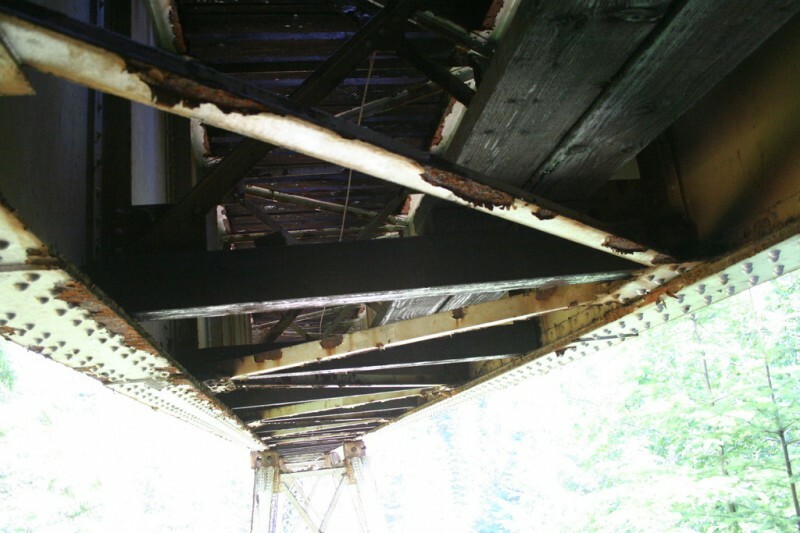 After taking that picture I walked underneath the trestle and saw that there was a makeshift wooden ladder there leading up inside the steel box structure. This is the view from the top of that short ladder. 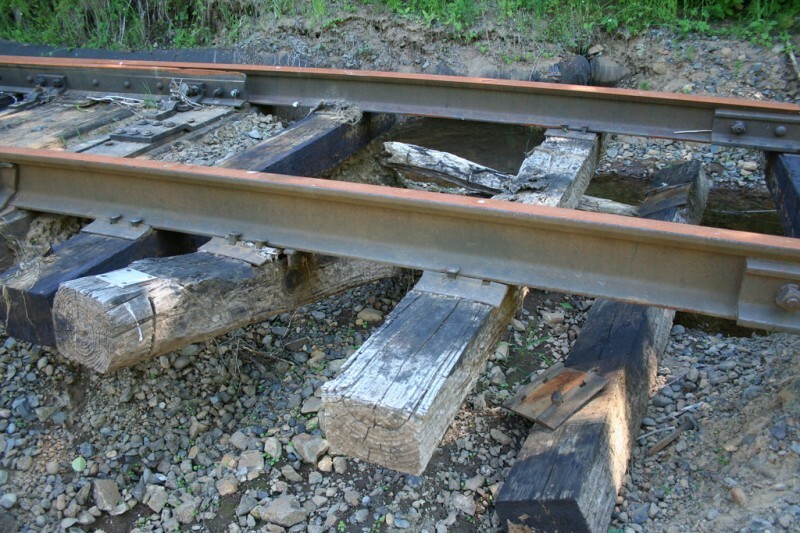 As you can see there are wooden planks laid inside that you could theoretically walk along if you wanted to cross without danger of a train hitting you. I really liked the lighting and the perspective of the view in there. I took a few shots trying to capture it a little. 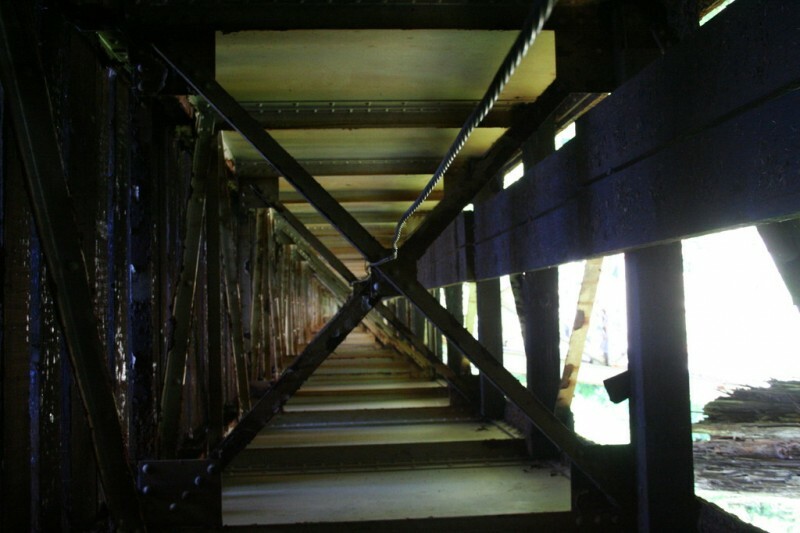 This was from a little lower down the ladder so you could see the bottom of the trestle as well as the inside. This is one of my favorite shots. After climbing back up and resuming our hike, this was one of the first views that greeted us. 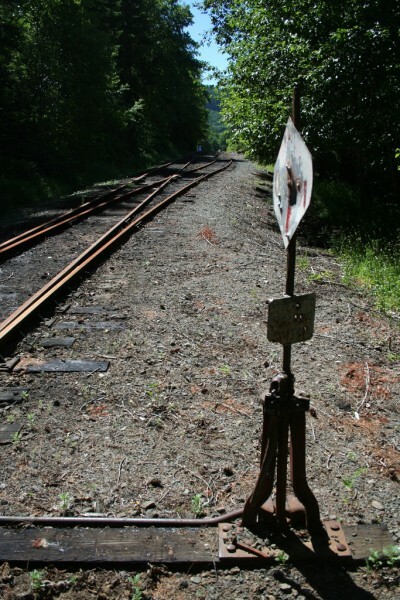 I think this was the first railroad switch that we encountered. It was pretty neat to see it in person up close. 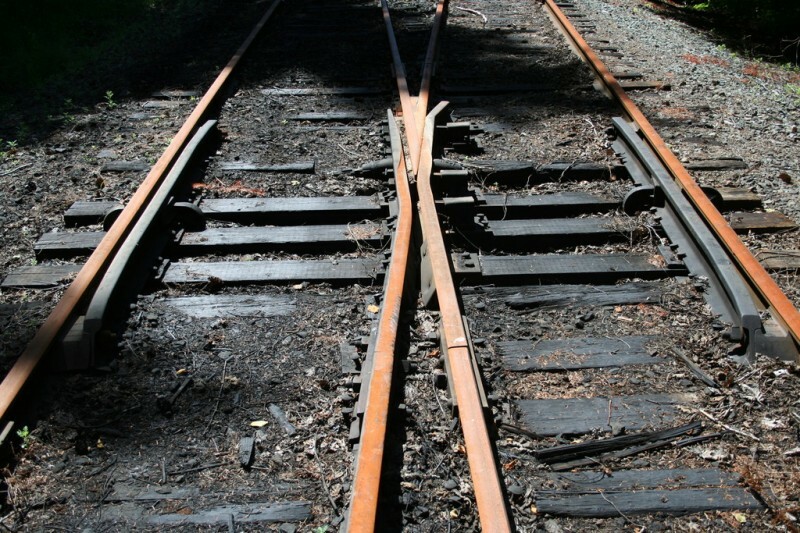 I think this is the mechanism that one could use to actually switch the tracks. 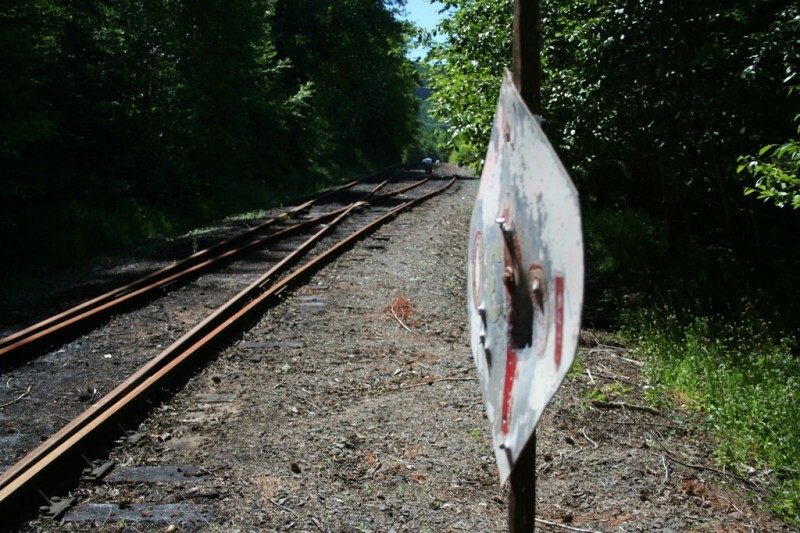 The sign is pretty worn and hard to read, but it says "ATTEND TO DERAILING SWITCH." 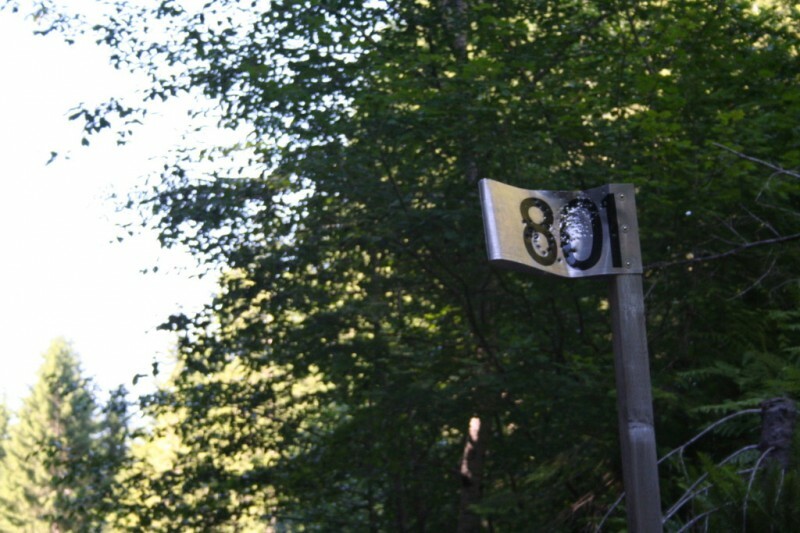 There was always a diamond shaped sign like this at the track switch. They always had two numbers on them whose significance we were never able to discover. Put the previous three photos together and you get the whole picture. Just a closer shot of this side of the switch. 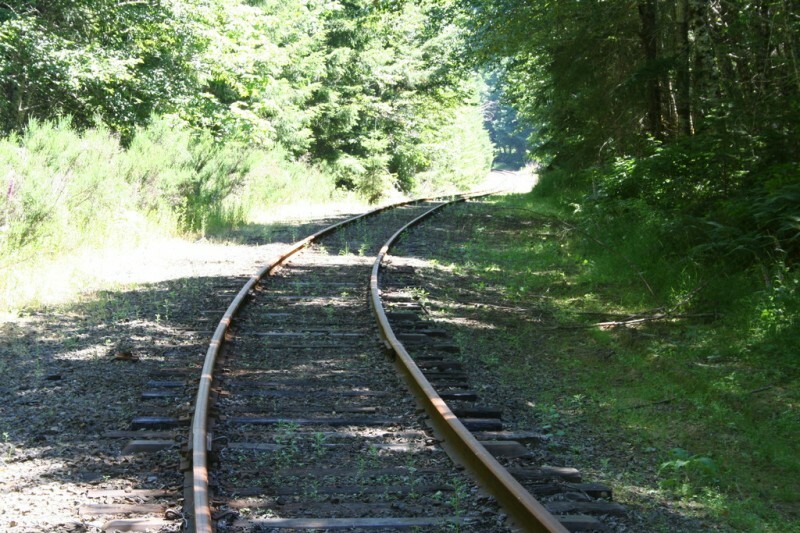 So, when we came to this spot we realized that there was a problem with the track and it wasn't being used. Until then we hadn't seen any major damage but we were about to. 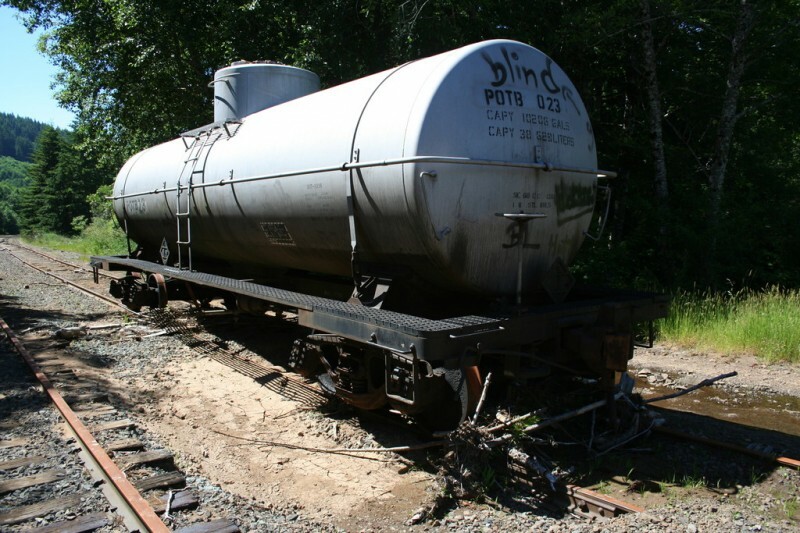 Sam said this old tanker car had been sitting here last time he came. 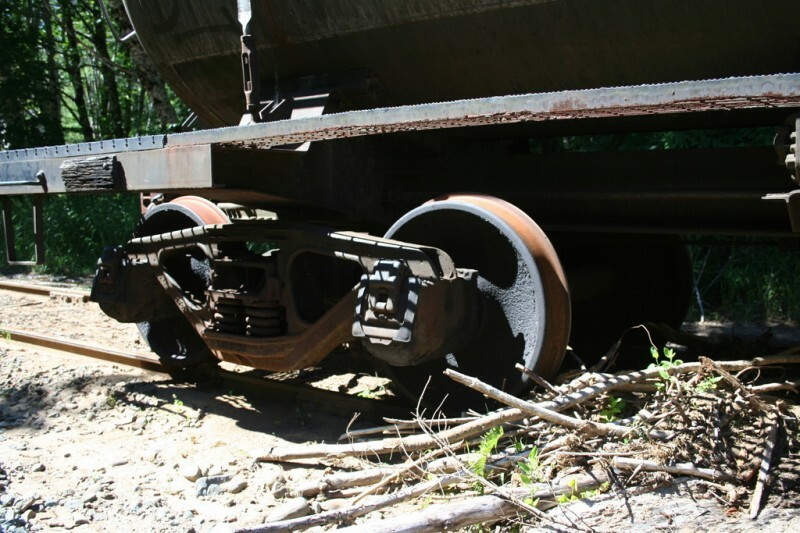 If you look at the base of it, in front of the wheels, you can see a bunch of debris that had washed over the main tracks up against it. Debris piled up against the other set of wheels too. 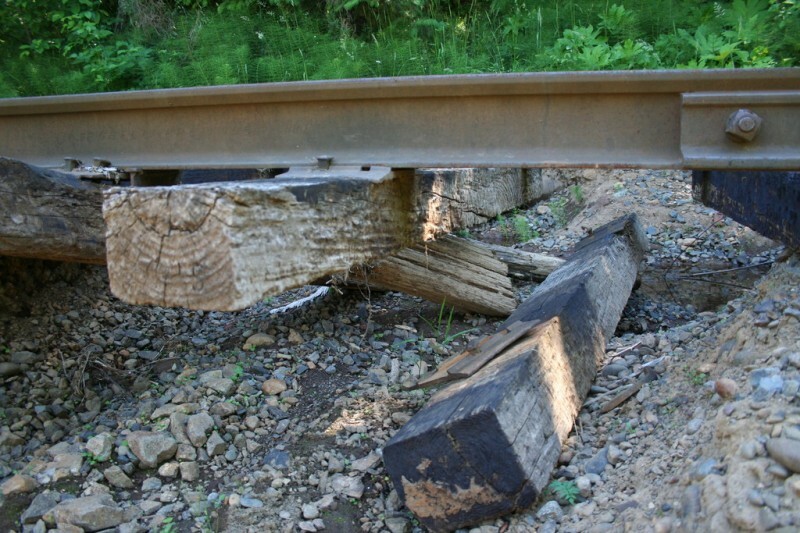 Here's one of the first shots that starts to show some of the damage. 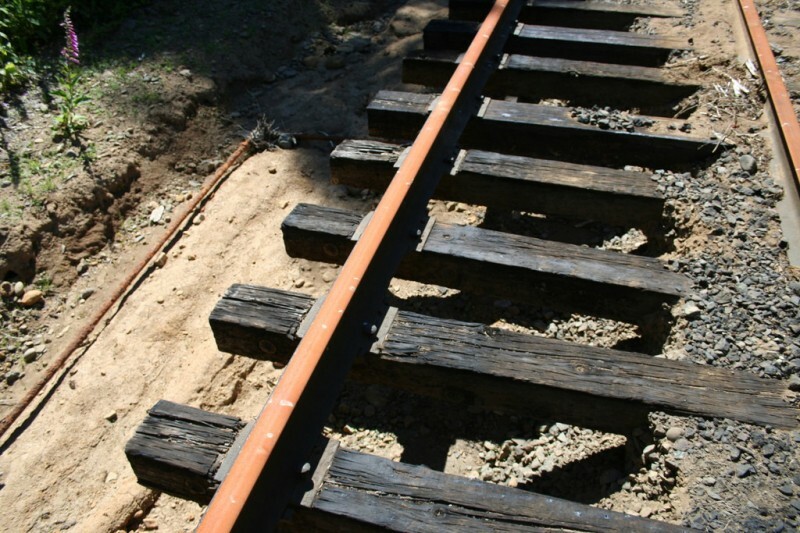 Obviously for stability and all that the ground underneath the railroad ties should extend far out from the tracks and it had all been washed away. 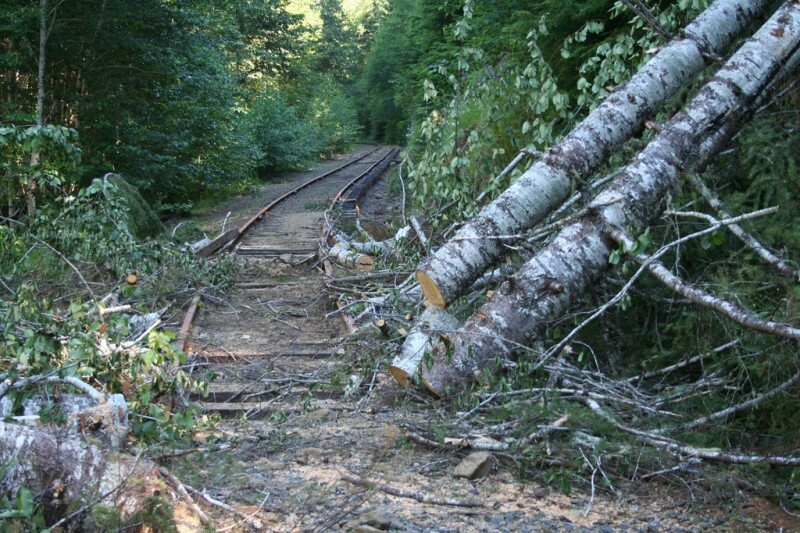 Almost the entire length of the track from here on on our hike was like this or in many cases much worse. 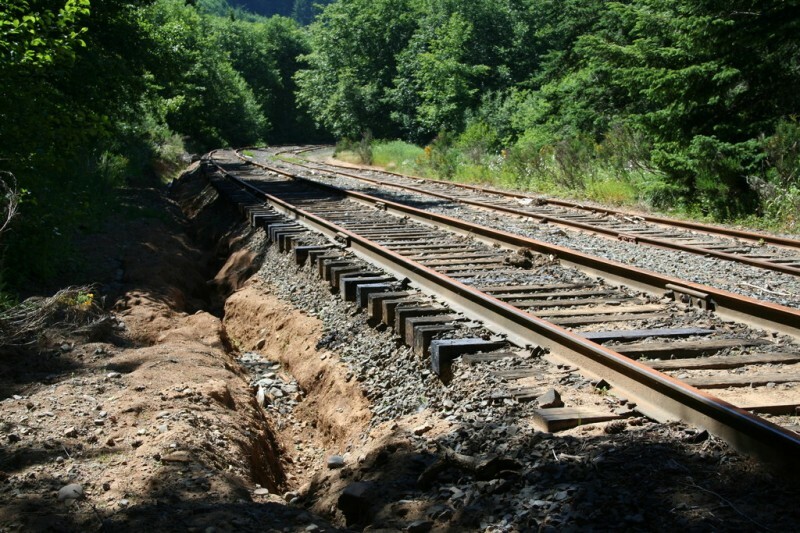 You can see how the storm water dug a deep rut through the ground all along the track. 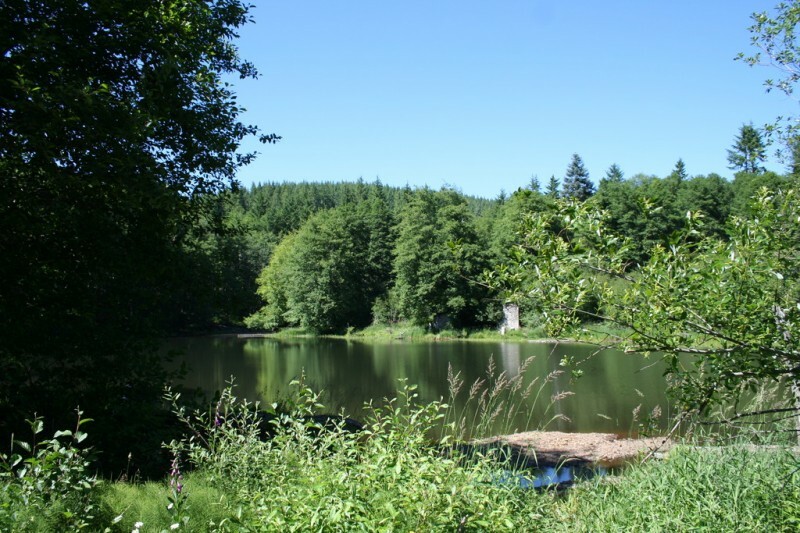 I was sort of surprised when we came across this little lake. It's sort of hard to see but that cement colored thing on the opposite shore, is, well, made of cement. It looked like some sort of large column as you would find supporting a bridge. We couldn't figure out what it was or what it used to be. 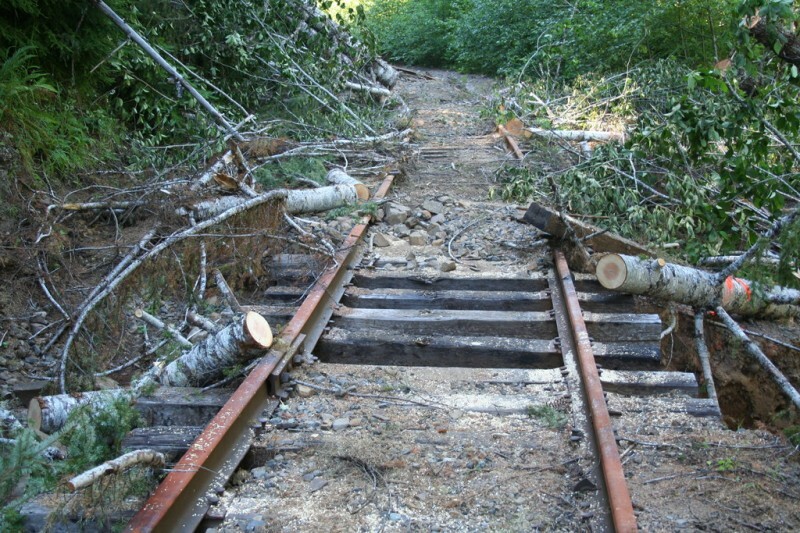 This was a section of track right by the lake, where we presume the torrent of water running down that rut on the other side crossed over and under the track and flowed into the lake, leaving no support for these ties that were now just dangling. 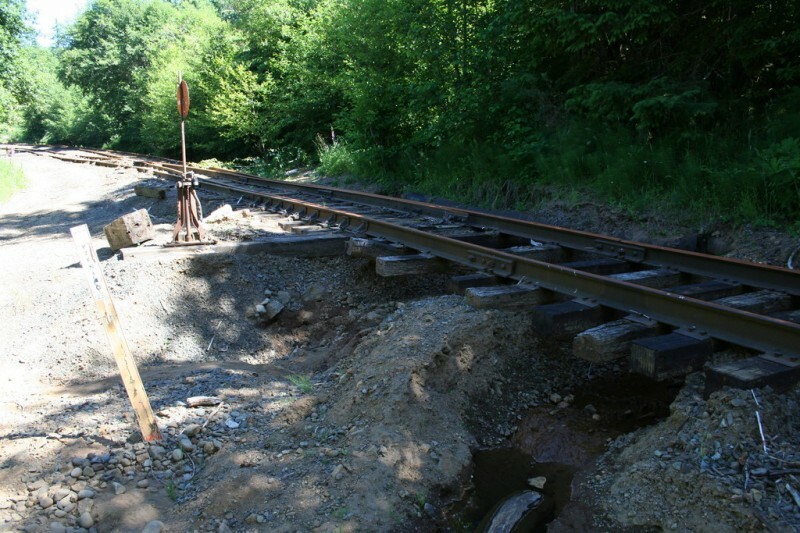 Here you can see where water is still running under the track down toward the lake. I'm sure every time this area gets a good rain that rut fills and water runs it's newly built course. 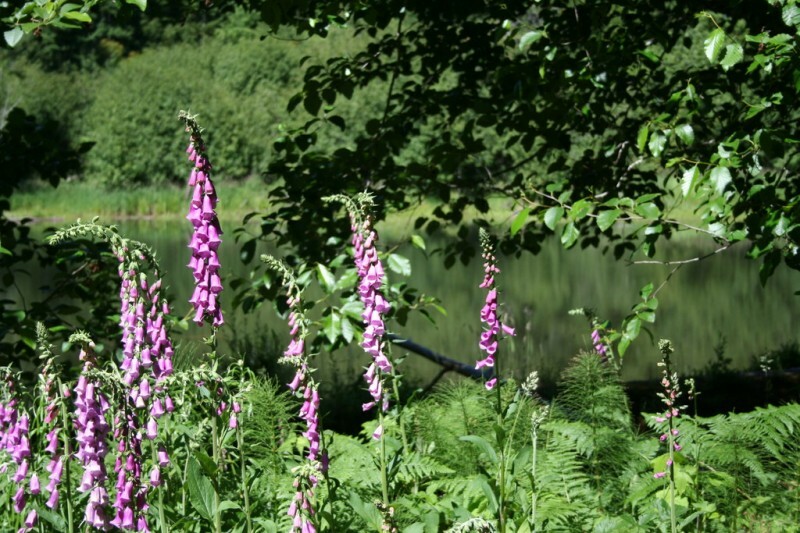 More purple foxgloves by the lake. Our parting view of the lake. 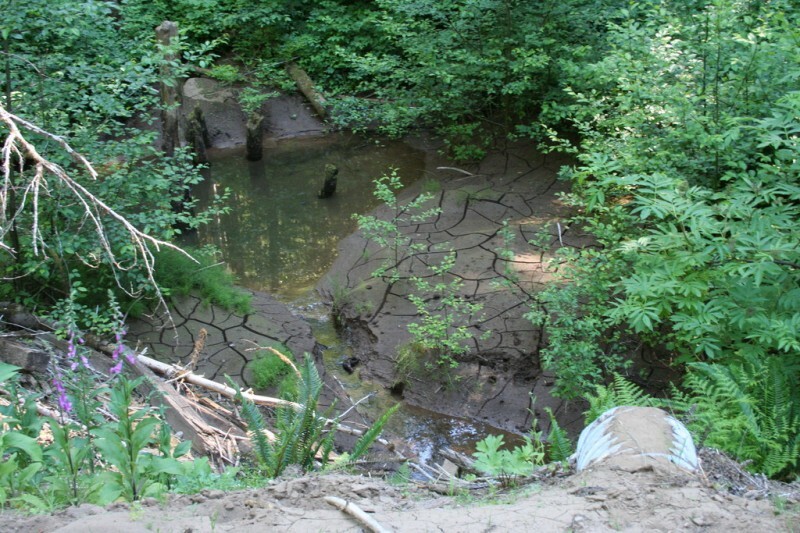 Here was another spot where we could see the floods were forced to change course. 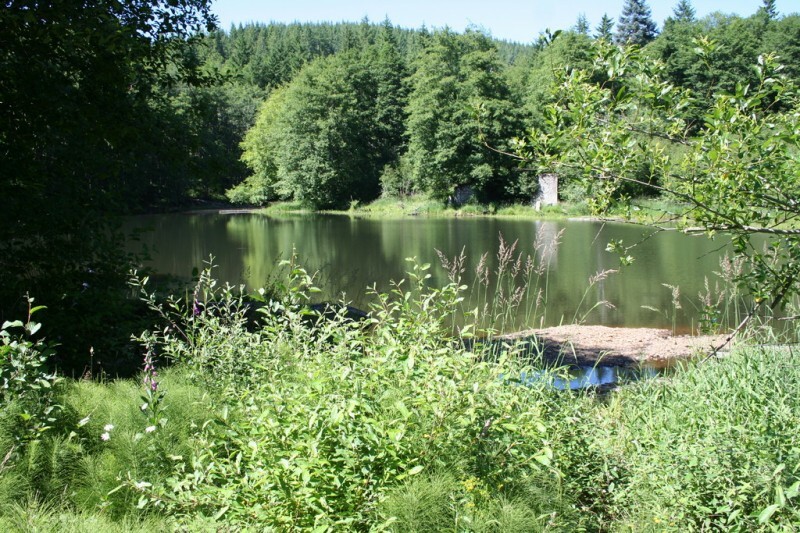 To the right of this there is a steep drop off, and the water must have come up against the upcoming hill and been diverted through the track down into the valley below. 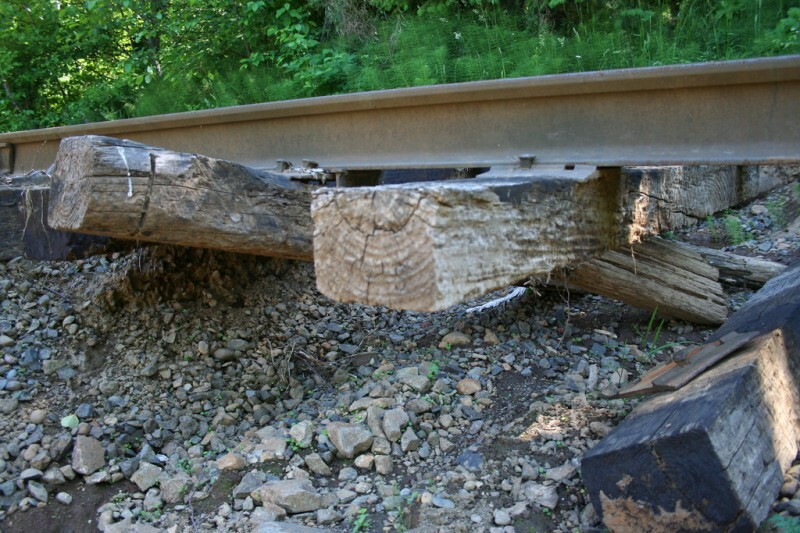 It had taken several trees with it that you can see had been cut to marginally clear the track since they initially fell. This isn't the best shot and it's hard to tell what you're looking at, but this is the valley downhill from the track at the same spot where the last photo was taken. 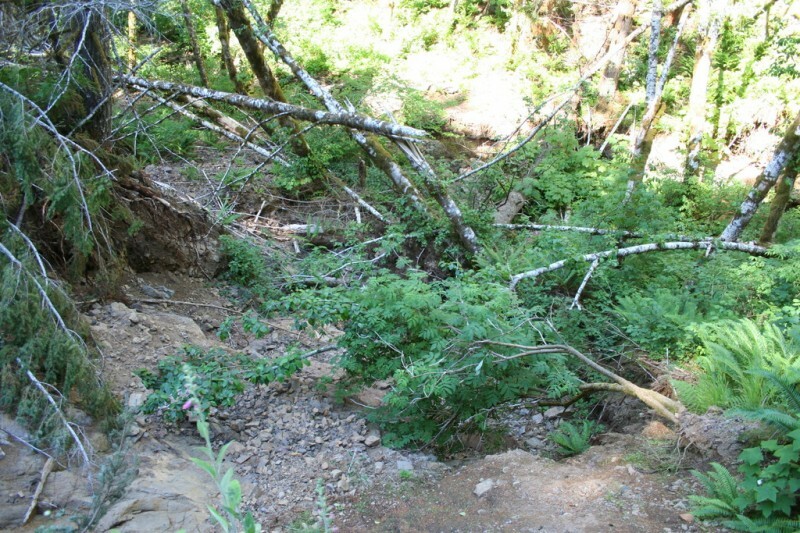 You can see quite a few trees were washed down into the valley and are now lying there all jumbled up. 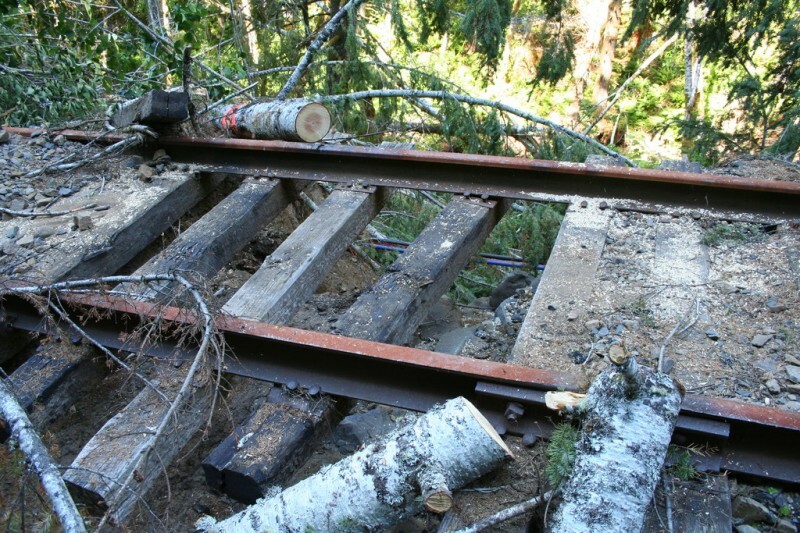 You can kind of see the unsupported track and the valley below in this shot. 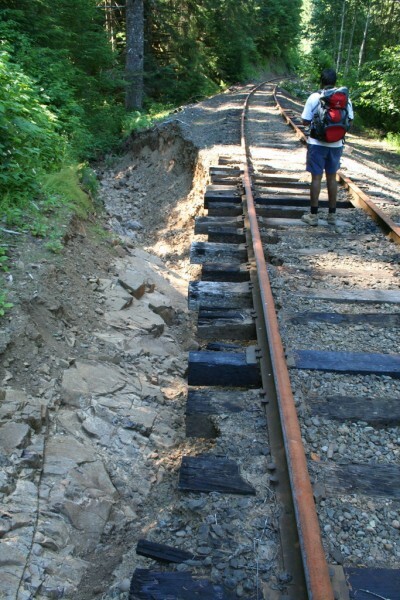 As you can see, here the flood brought a rock slide that completely covered the tracks. 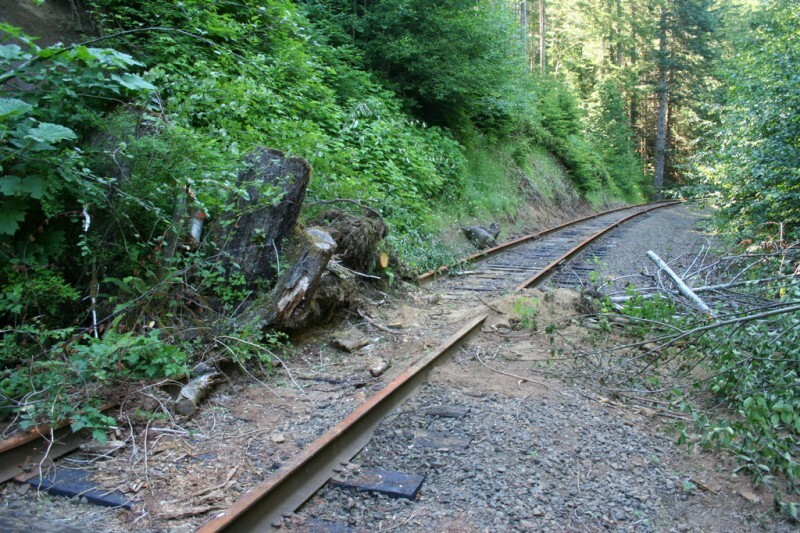 It looks like they cleared the track basically just enough to be able to walk through, probably to assess the damage. 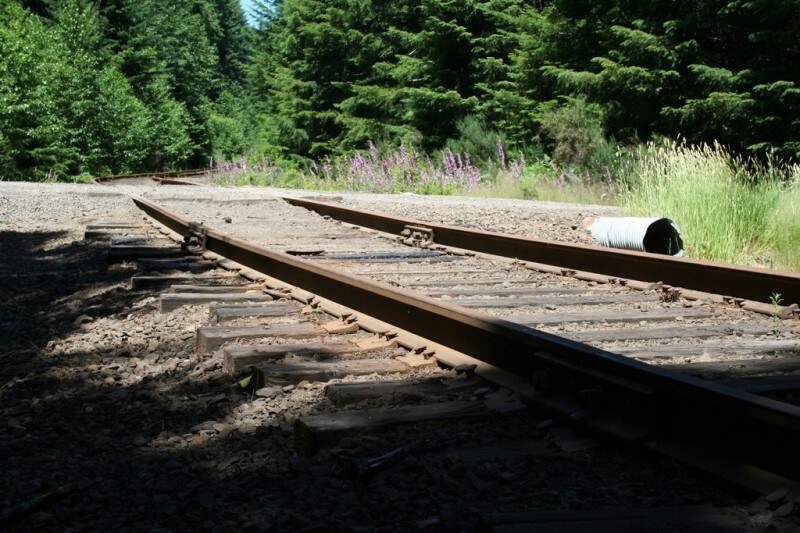 Obviously no train could make it. 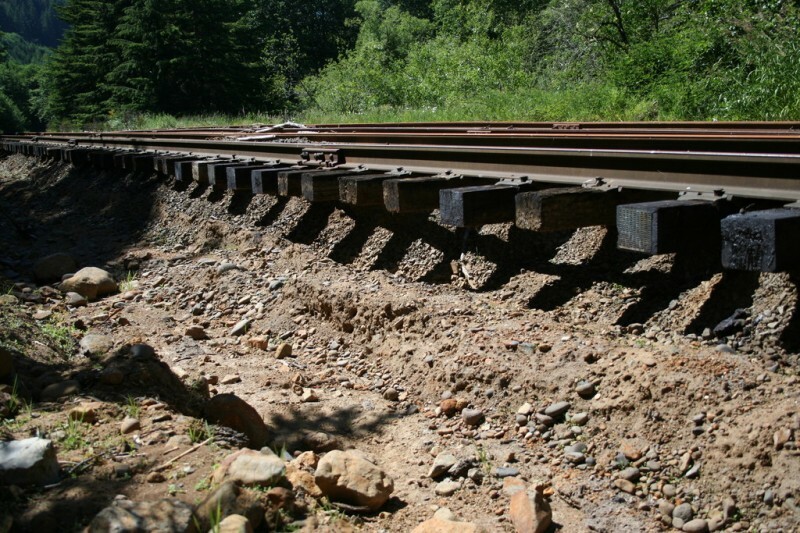 More evidence of relatively recent flooding to one side of the track. 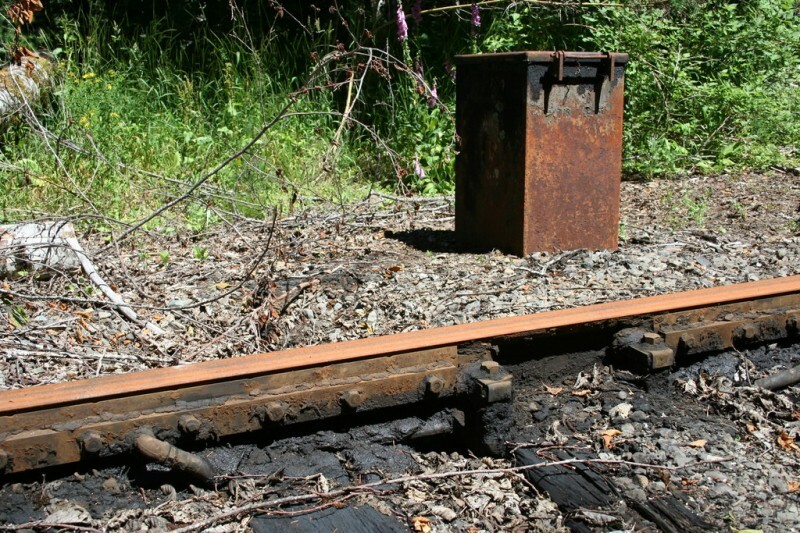 ...bringing a stump and lots of mud onto the track. Sam is a brave man... just another slightly unsupported section of track right? Make that very unsupported. 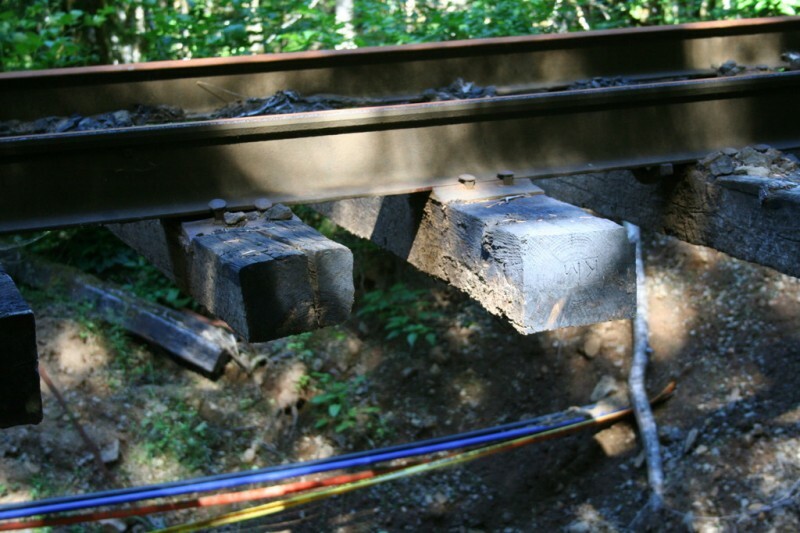 This section had literally probably ten feet of air between the track and the solid ground. It was crazy. We actually went around I'm pretty sure because it was very sketchy. This provides better perspective on it. It was crazy. We couldn't believe it. We were talking about how many dumptruck loads of fill it would take to fix this. Quite a few! You can see the unearthed, previously buried fiber-optic cables over there on the far side. 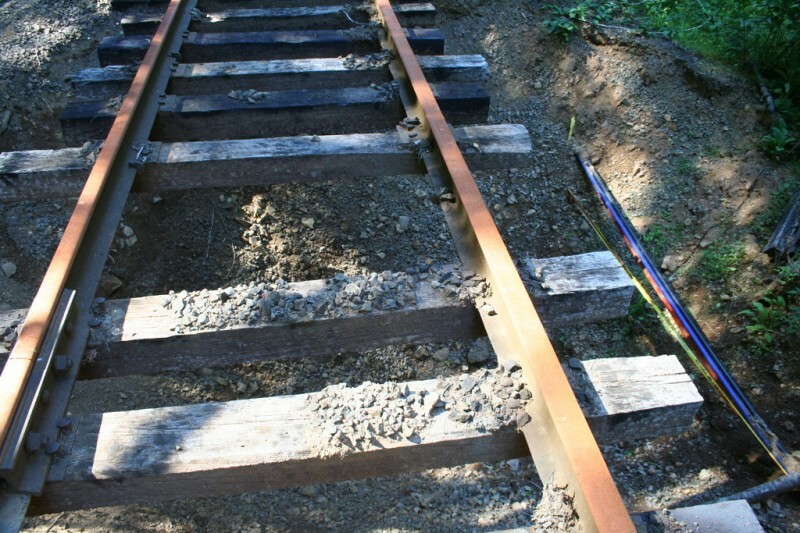 Yeah, not a good idea to try to walk on these. ...which some people apparently thought would be a good thing to use for target practice. 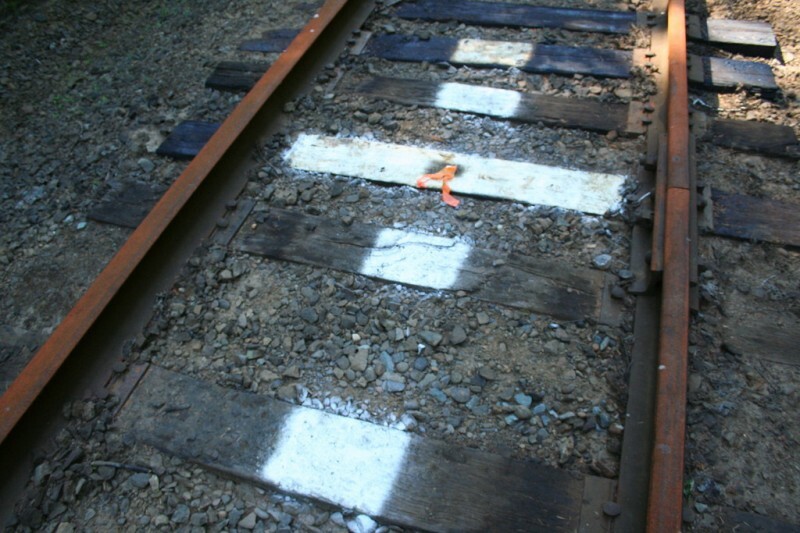 These markings were another thing we weren't sure about. 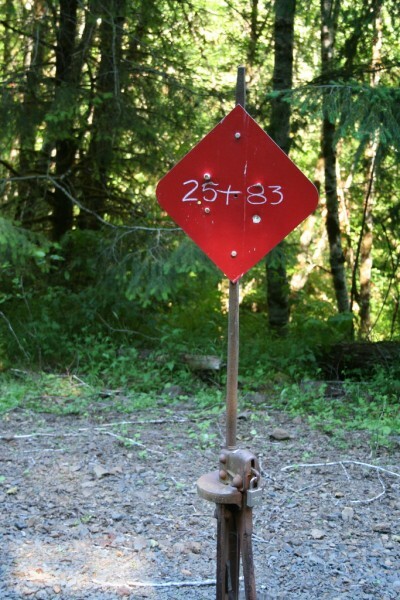 What is the significance of the numbers? The plus sign? This I thought was really cool. 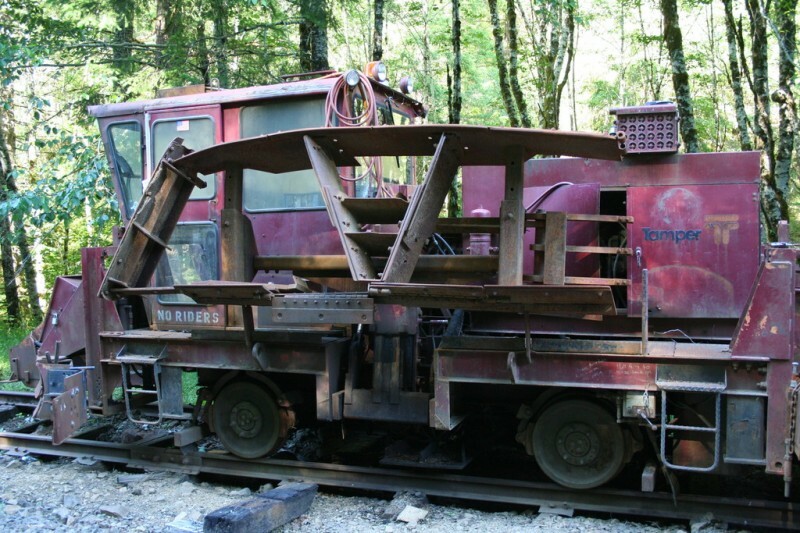 It's a Ballast Tamper which is a machine that's used to pack the track ballast--the surface the track sits on. It was just a really interesting looking thing. 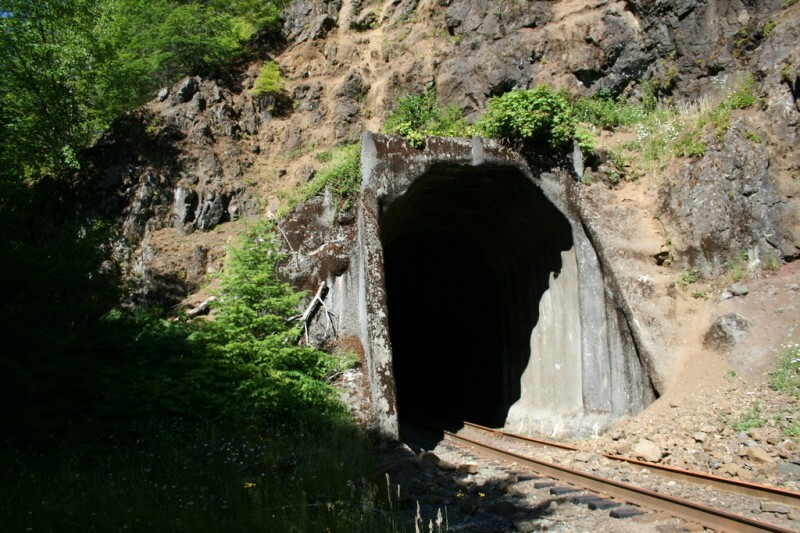 It was cool that it happened to be stored here or abandoned or whatever so we could check it out. I just think it is so cool looking. 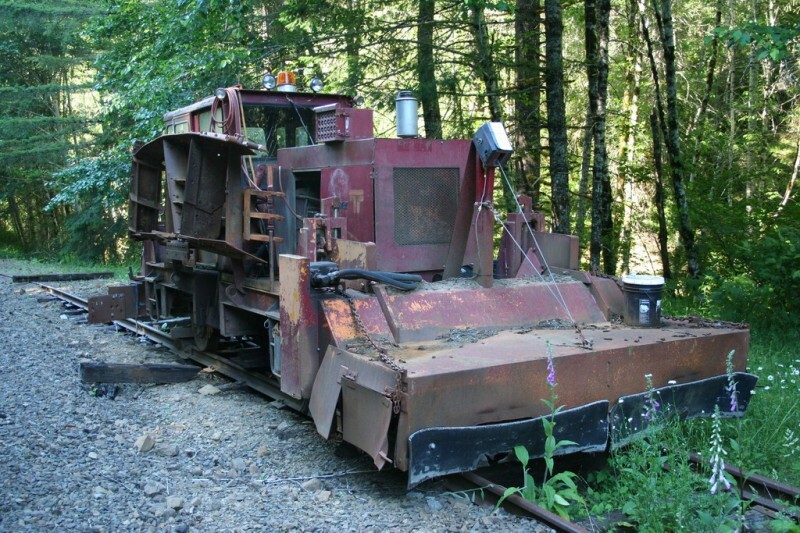 If I had a model train set, I'd definitely want one of these... all rusted up too. 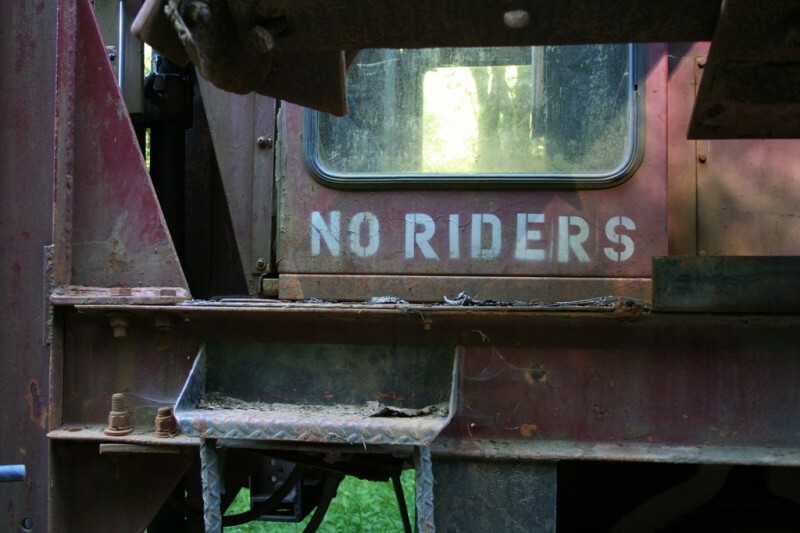 Apparently they don't want people hitching a ride on their tamper. It looks cool even from the back. Just an all around cool machine. This was the view as we approached the tunnel that would be our turn around point... well, on the other side of the tunnel. I hadn't mentioned yet, but to my surprise, sort of, we actually walked on the track the majority of the time. I thought that might be painful after a while, but it was not too bad. You just had to sort of adjust your steps so the right part of your foot landed on the flat wood. Here you can see a little of the texture of the inside of the tunnel walls. This was really random. 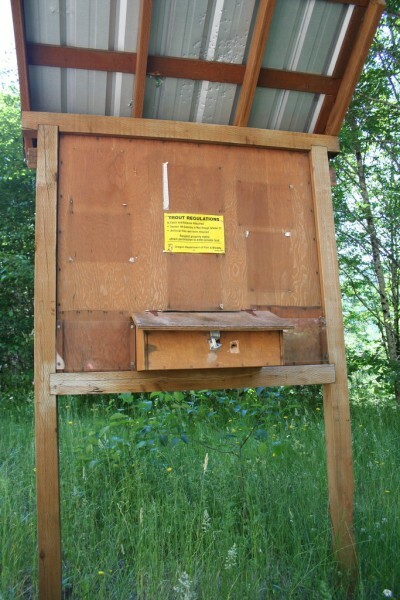 I don't know if you can read it but it says "Trout Regulations" and there is a box that I think contains pamphlets presumably regarding trout fishing. 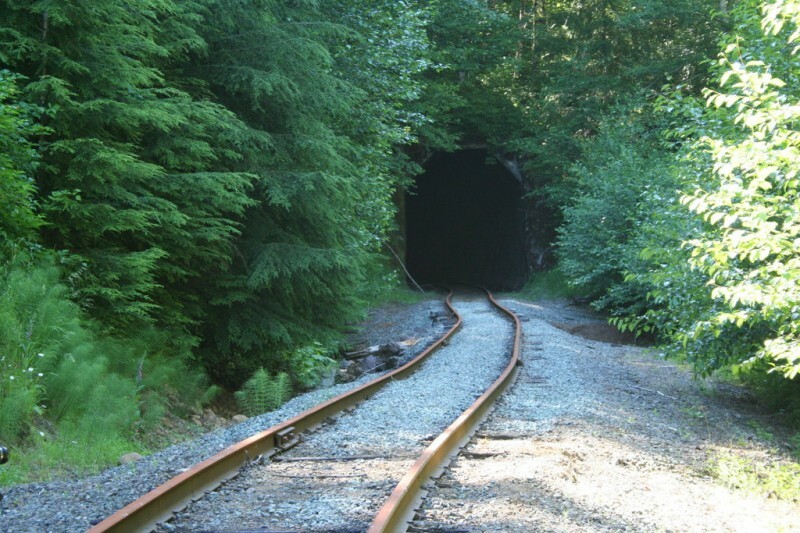 It was almost right on the other side of the tunnel, seemingly nowhere near where people would generally be--unless people fish from moving trains? Very, very strange. 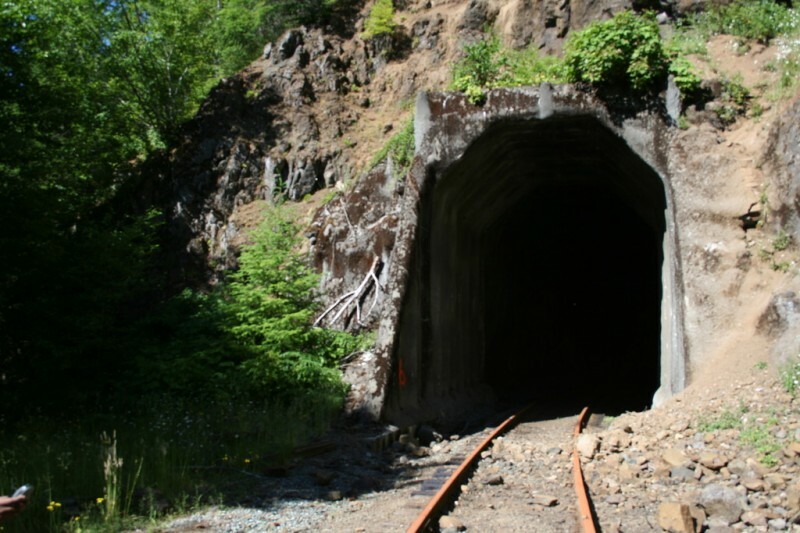 This was the view of the far side of the tunnel and our last view before heading back. Even though the hike was really flat and not ridiculously long (was it 10.5 or 11 miles?) it seemed pretty long to me. I was pretty tired at the end. I think it was because we were in direct pretty hot sun (lower to mid 90s I think) most of the time. 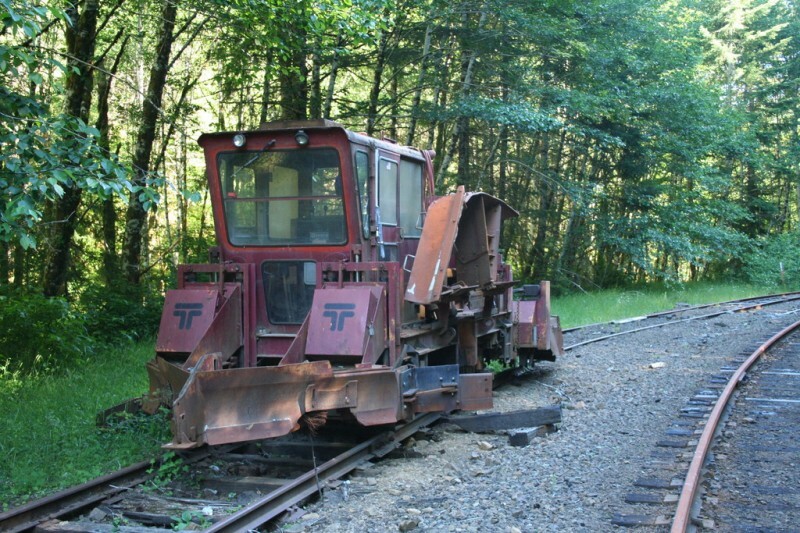 But it was definitely enjoyable and I learned a lot about trains and railroads. That was the best part for sure. Thanks to Sam for encouraging me to check it out.